Dog Canyon to Marufo Vega, almost. I always have trips in the planning stage, some take years to get around to actually doing, this one was just such a case. 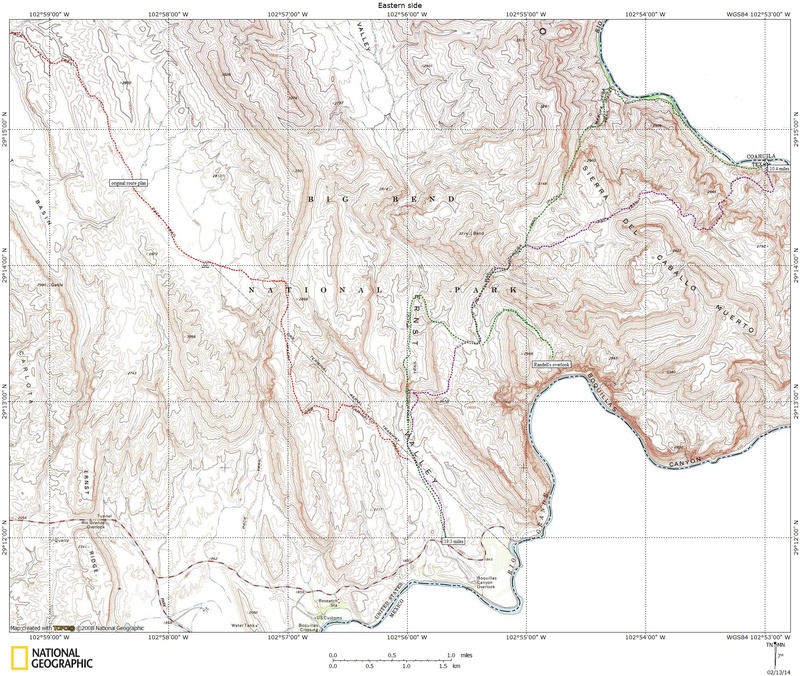 The idea of a long walk, north to south down the long eastern side of the park that would tie together many interesting places I had never been to was the basic idea. 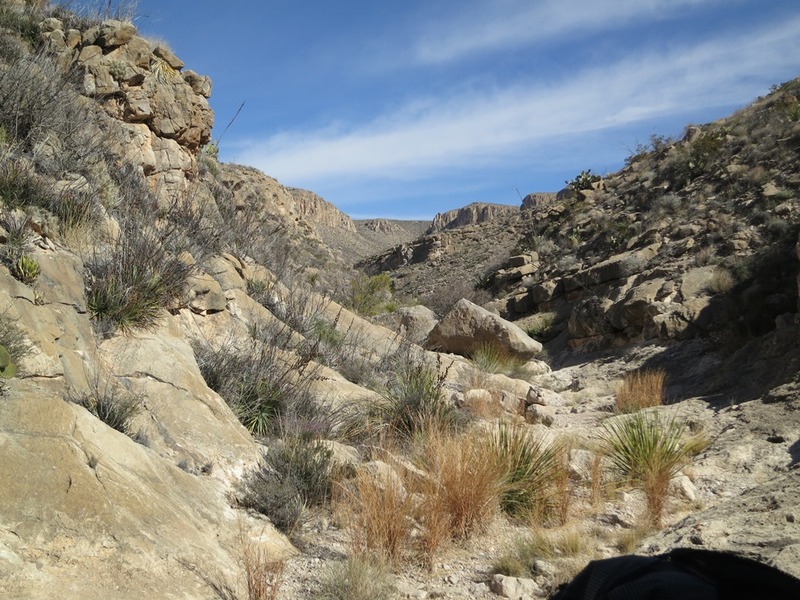 The initial sparks for the actual route came from threads on Big Bend Chat about some out of the way places not normally seen by folks. 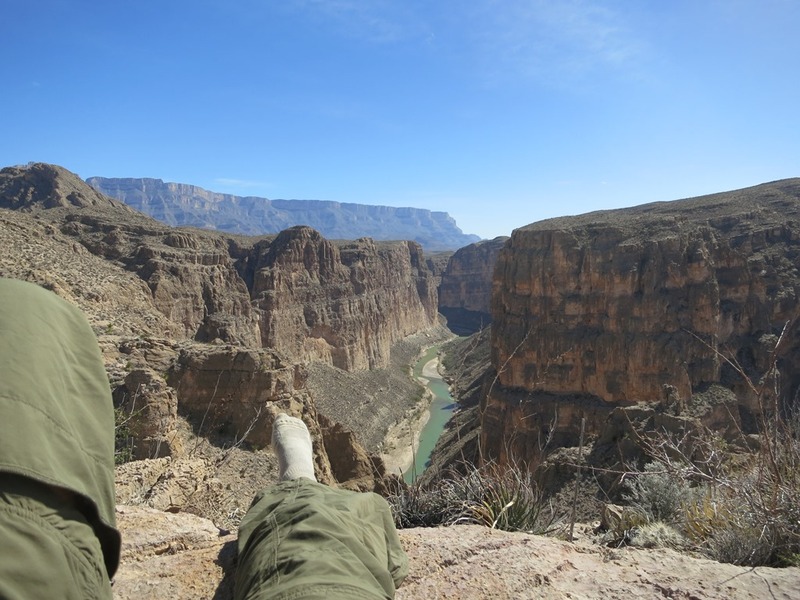 2013 marked the 40th anniversary of my first trip to Big Bend but we couldn’t get it together to do a December trip which has become my normal window. Early February would do nicely but the crazy winter weather of 2014 would conspire against us a bit. Scott and Lee would both return to the park with me, the first time back for each of them since Scott walked with me across the eastern half of the park in 2004 and Lee the western half in 2008. Just getting to the park was its usual endeavor. Flying into Austin, Lee’s flight was delayed by 5 hours and put us into Ft. Stockton at midnight, long day. Up early with rain and wet snow it begins to clear and warm up as we drop down out of the Glass Mountains, the clouds spilling down off the mesa after us. A stop at the Marathon Café for the last real meal for a week then into the park where we drop a cache off the Dagger Flat road and then to Panther Junction for a permit. 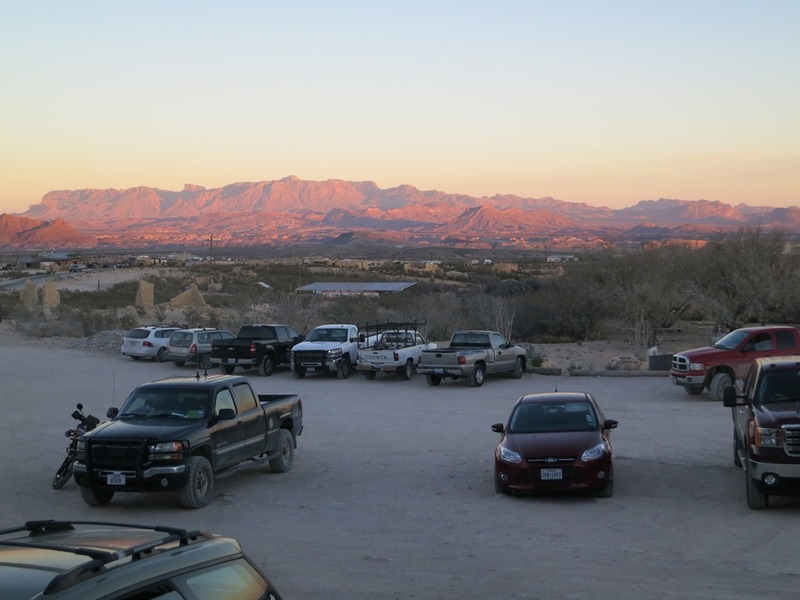 Our exit is the Marufo Vega/Strawhouse/Ore Terminal trailhead which we don’t want to leave a car at for a week, overnight OK but not 7 nights, so we drive down to the Boquillas border crossing station to see if we can leave it there in the relative safety of the Border Patrol etc. and it would only be about a mile and a half walk from the trailhead. They say sure. 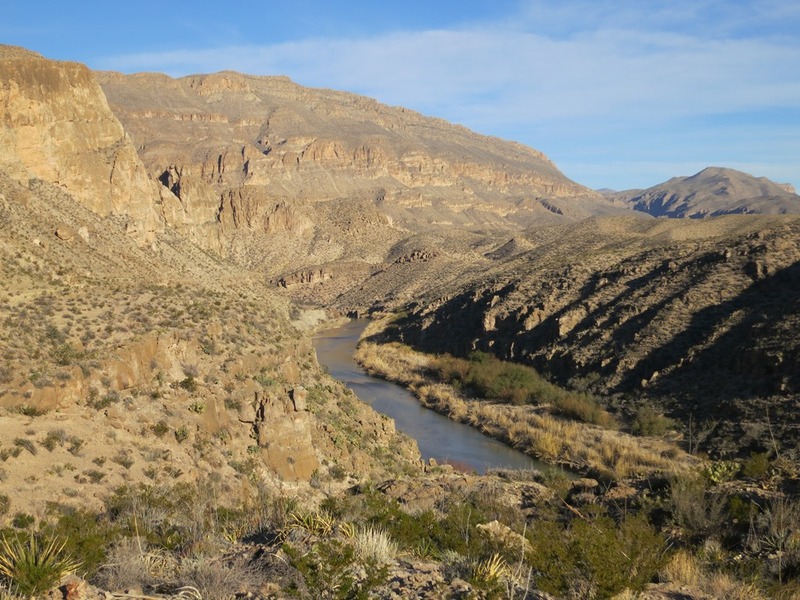 We drive back to the Rio Grande Village visitor center to finish packing and meet our shuttle by 11:30. 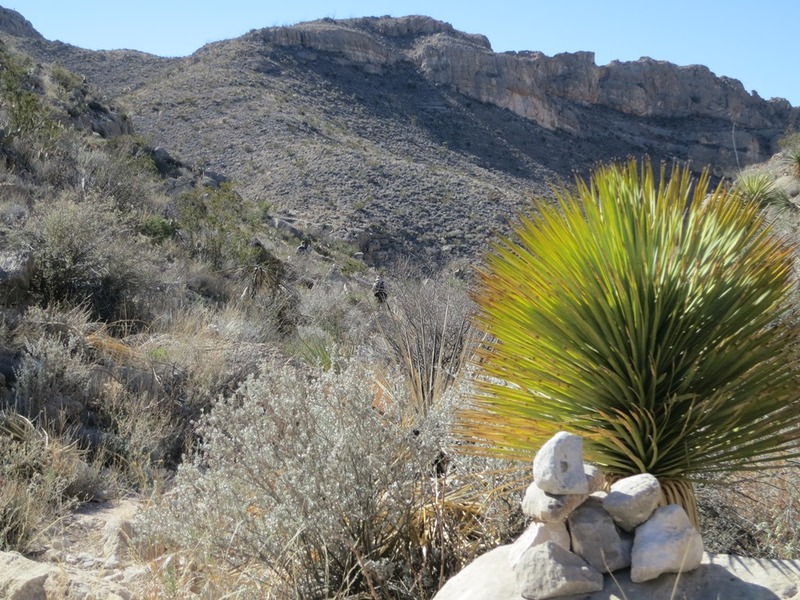 I had put out a feeler on Big Bend Chat for a ride and got a reply about a week before we were to leave. Casey showed up right on time and had us to Bone Spring draw by 1:00. It was great to meet him, found out we even graduated from the same high school! Without his help the logistics of getting to the trailhead would have been more difficult and expensive, we cannot thank him enough! Off down Bone Spring draw, just about a mile, to the Devils Den exit for the night. I had planned this first day to be just a short walk in as I was not exactly sure how long it would take to drop a cache, get permits and get back to the starting point so we carried in an extra gallon of water each just for the afternoon and next morning with the rest of the water in the packs that would get us to our cache on the third day. You can see Devils Den cutting its way down the slope directly ahead. 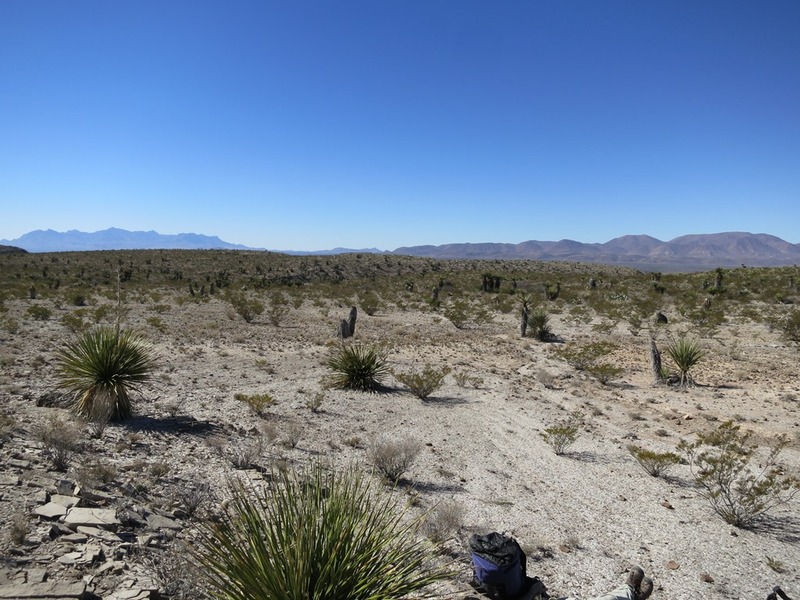 It was a beautiful day but windy, we found a campsite up on the flats mostly sheltered behind some big creosote bushes and settled in for a late lunch. 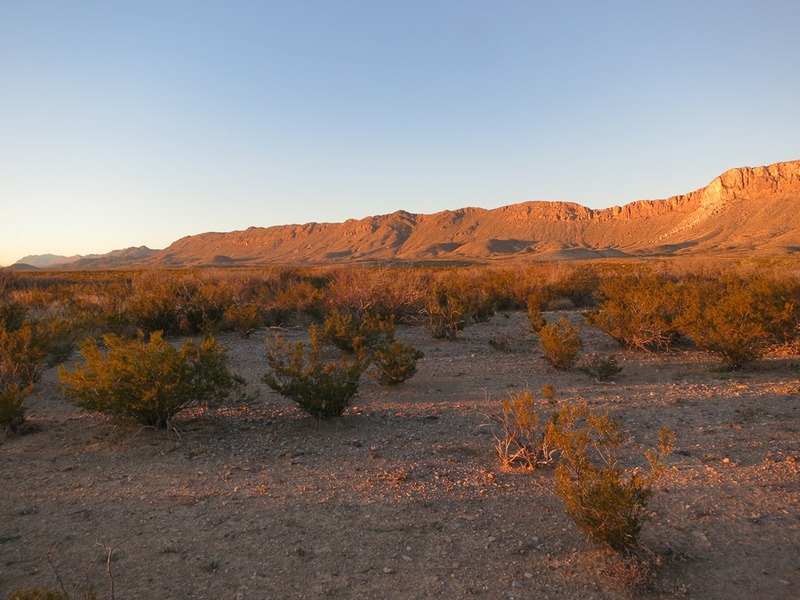 Late afternoon we day hiked on down into Dog Canyon with its flat bottom and tortured geology, especially on the southern Sierra del Carmen side. 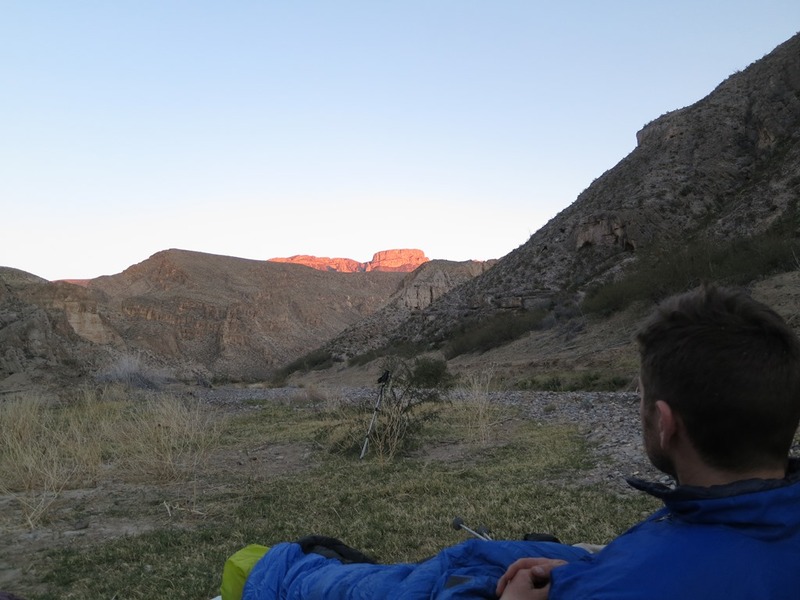 Back to camp we have a nice dinner with a gentle sunset on the Santiago mountains. Trail Day 2 but the first full day of walking. 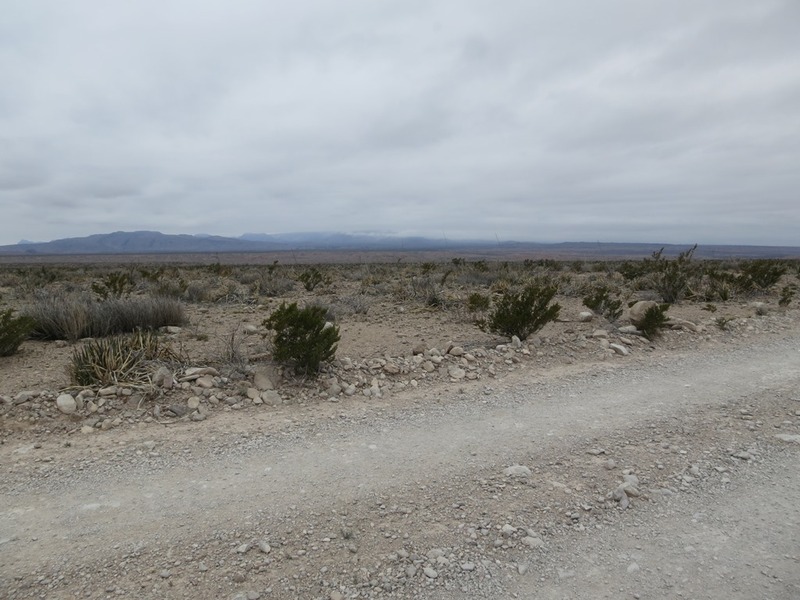 The wind blew like hell all night and we woke to 31 degrees and an overcast sky, what happened to our beautiful desert weather? This would turn out to be a pattern for the whole trip. 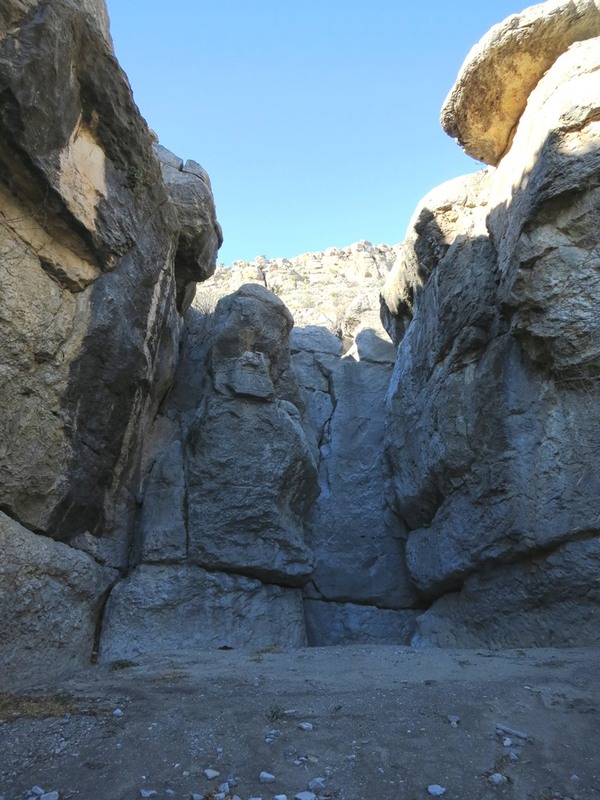 Quickly up the wash for Devils Den to the first rocky section and tinaja holding some water, it has a tiny arch in it to boot. We take the easy trail up alongside Devils Den not wanting to climb the small pouroffs with full packs. Good views down into the cut, both up and down canyon, showed the many drops some with water at their base. At the top we drop down into the wash that drains the northern end of Dagger Flat and then exits out down Devils Den. We plot a route up the opposite ridge to the low saddle in the middle of the picture. 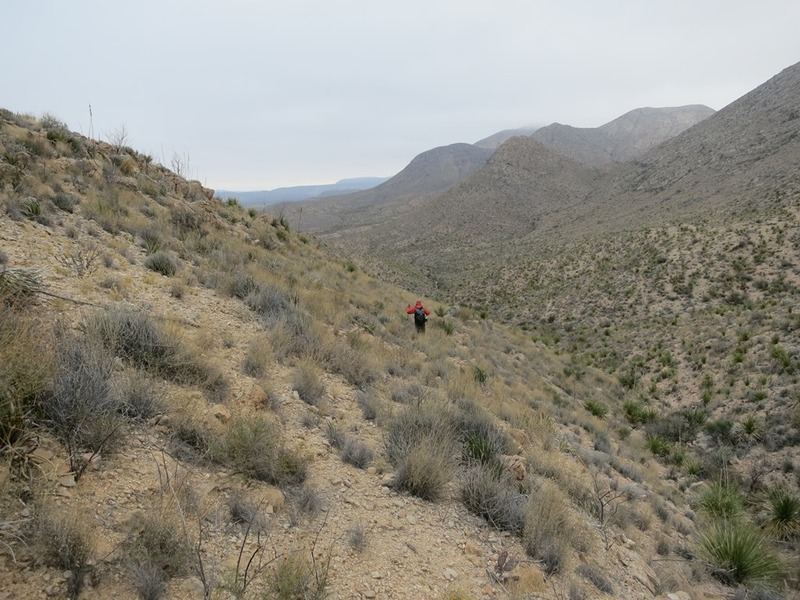 Not too hard a climb and as we cross to the other side we scare up a group of Aoudad that run over the far ridge. 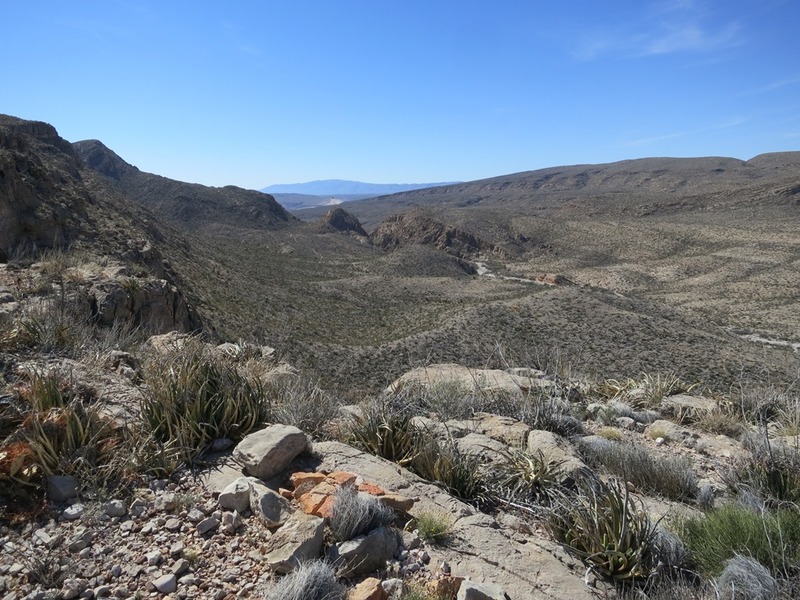 as we work our way across the northern foothills of the Sierra del Carmen on the way to the mouth of Canyon sin Nombre seen here in the far center of the picture. 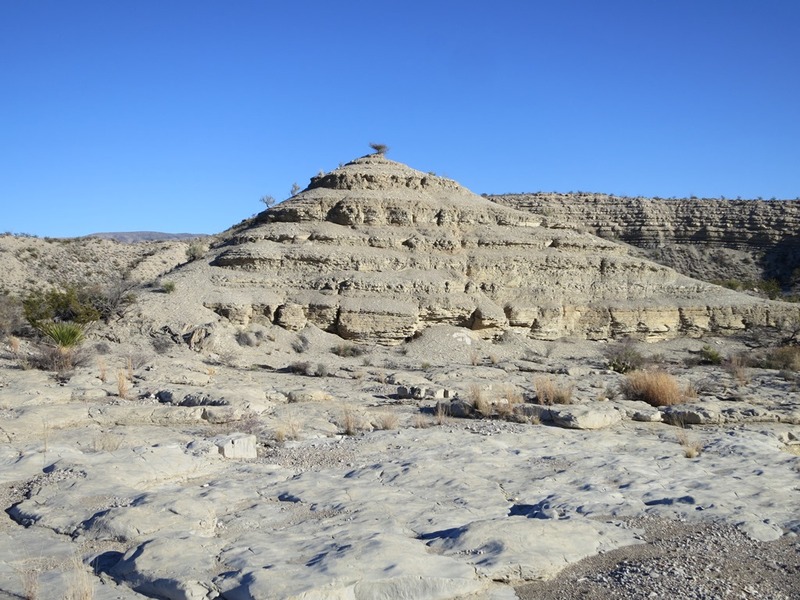 The canyon itself is a fairly easy climb/walk up into the southern end of Dagger Flat. Filled with quite a few boulders it is not too bad to work your way up wash. 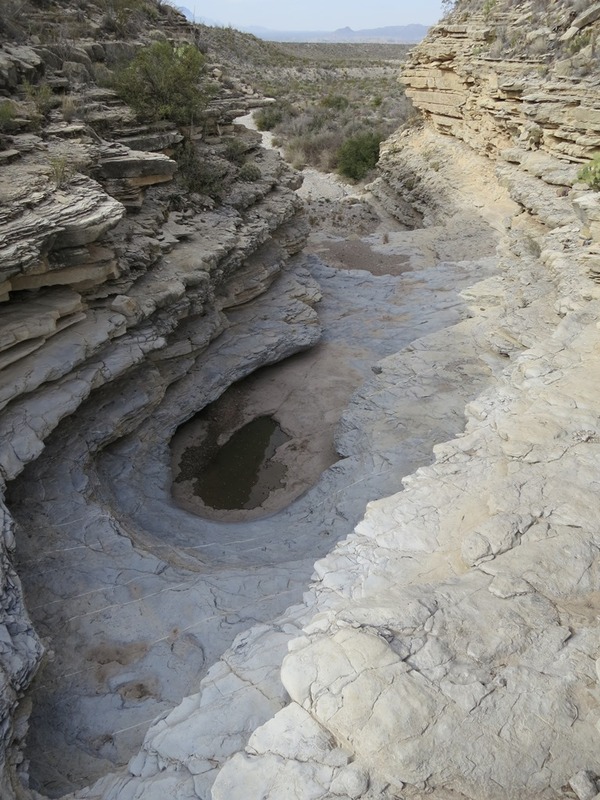 Even though this canyon is really off the beaten track we followed a set of footprints up canyon. 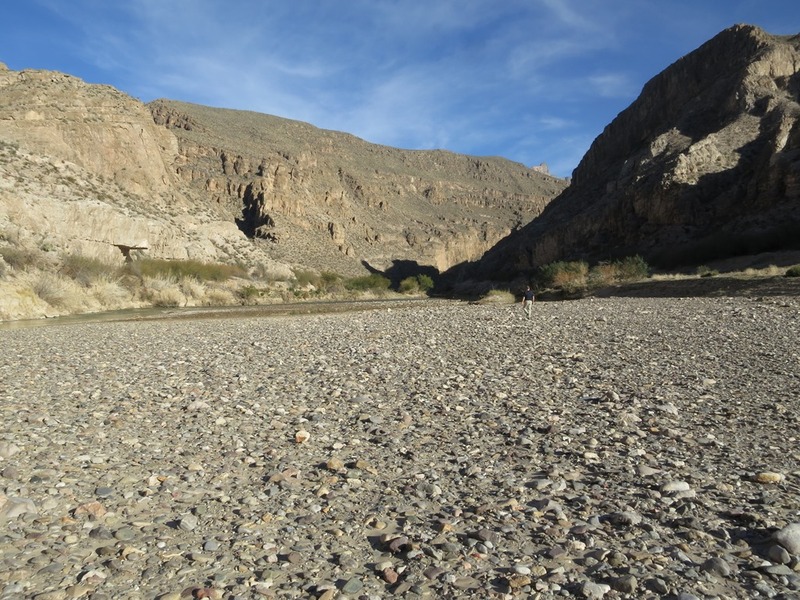 At the junction of the Buda and Boquillas formations we find a few tinajas, some with a tiny bit of water. 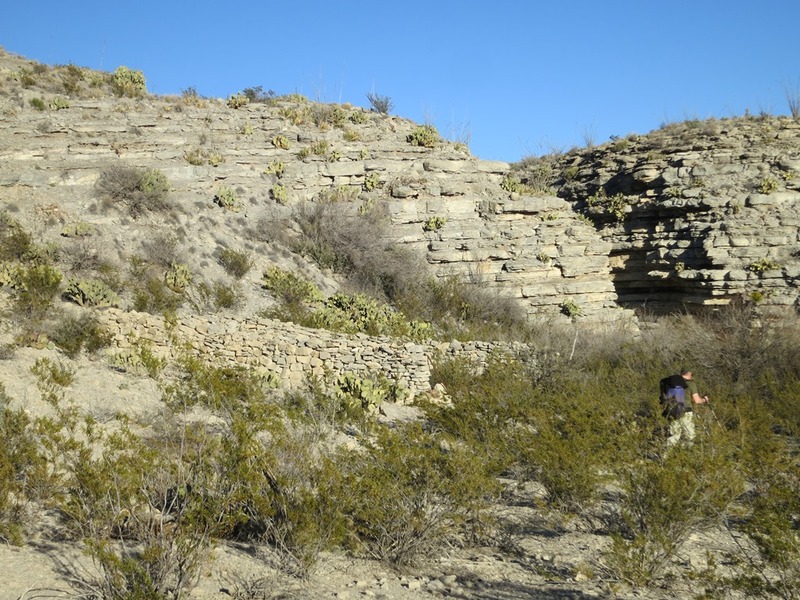 This contact of the two geologic layers almost always seems to give a few water holes in the lower Buda formation. Did I mention that it was a chilly day? The high maybe hit the 50’s, maybe, with wind. Finally we pop out into lower Dagger Flat and find a great campsite on some nice fine gravels for the night. 9.9 miles for the day and it appears to be clearing off giving us a tremendous sunset, best of the trip. 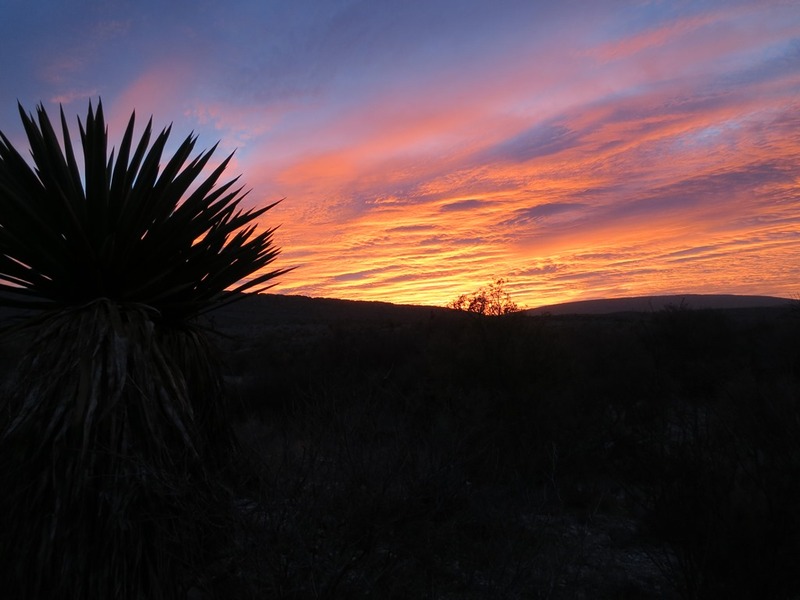 The clouds move in and out most of the night, then it clears off completely and the temperature plummets to 20 degrees! I only brought the 35 degree sleeping bag so there was some work to keeping warm. We awoke to heavy frost all over the sleeping bags and equipment. Of course the water was frozen too. But it was a beautiful sunny day and it warmed up quickly. 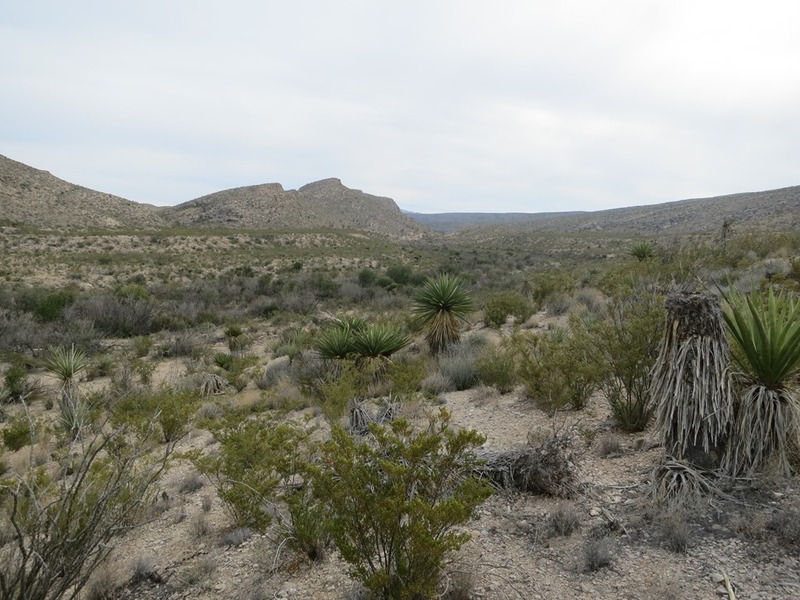 This is the view north through Dagger Flat and the long ridge of Dagger Mountain. 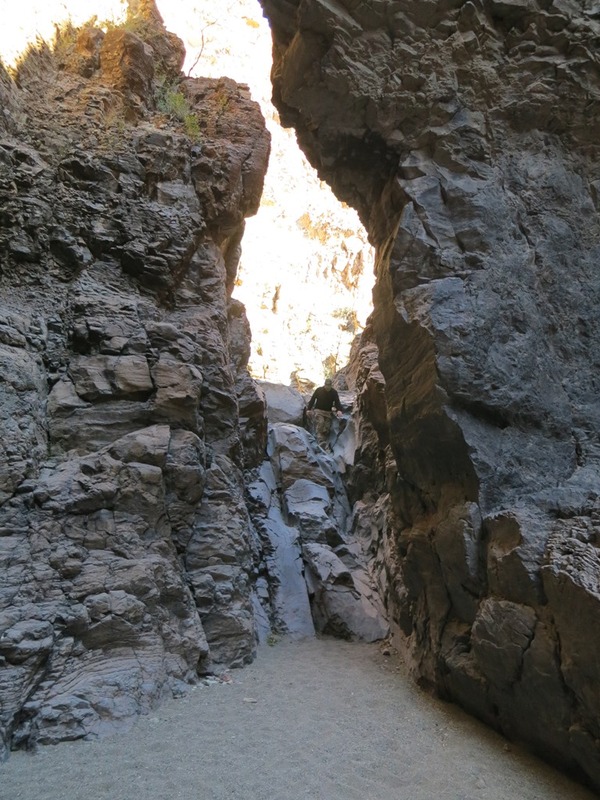 Several hundred yards into the canyon it became clear as to what the correct answer was, a 60 foot pouroff blocked any further progress without ropes. We turned around and headed north along the escarpment for 10 minutes and then climbed up through a break in the rim to the top, easy. Once up top there was a great view of all of Dagger Flat. This pano shows the entire valley looking east, from Dagger Mountain in the north down to the south end (Click on it to make it bigger, a second click makes it huge). 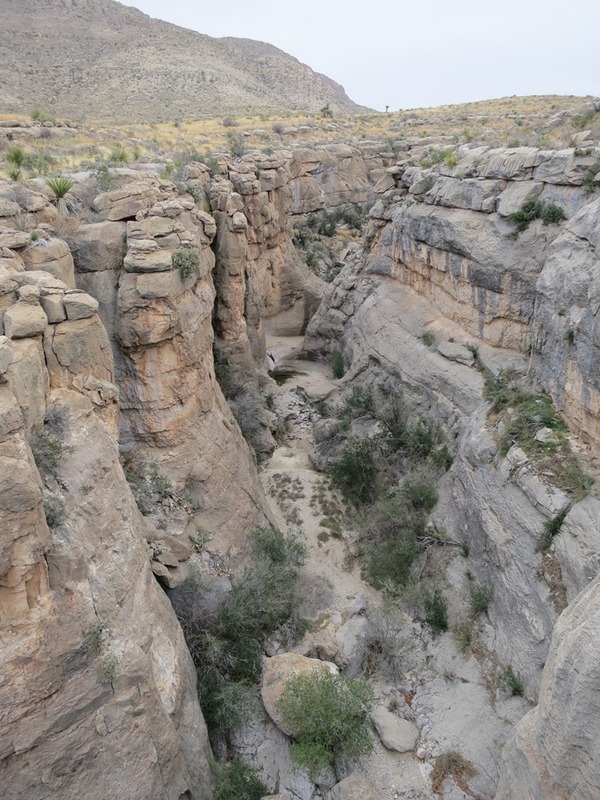 Canyon sin Nombre is seen as a dark squiggly line about three quarters of the way to the right. 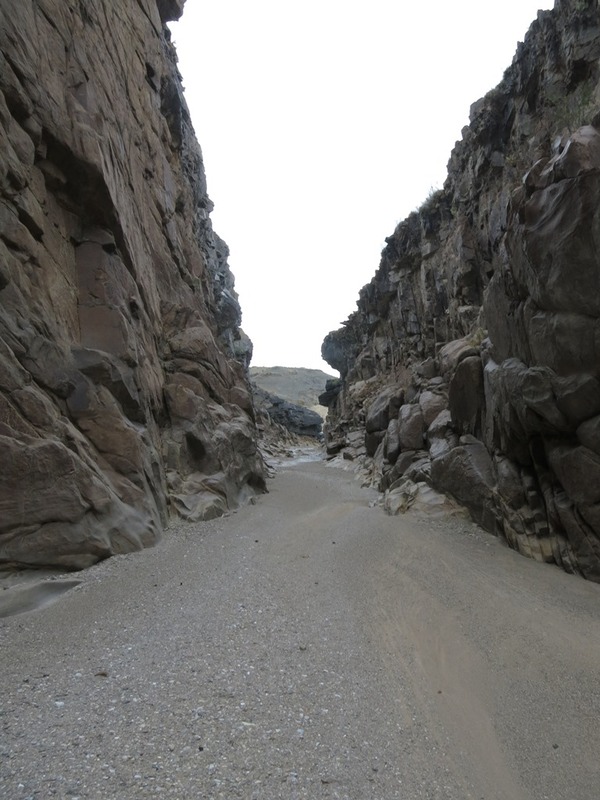 We work our way back south into the drainage for the blocked slot canyon and on south and over a small divide just east of pt. 3315. 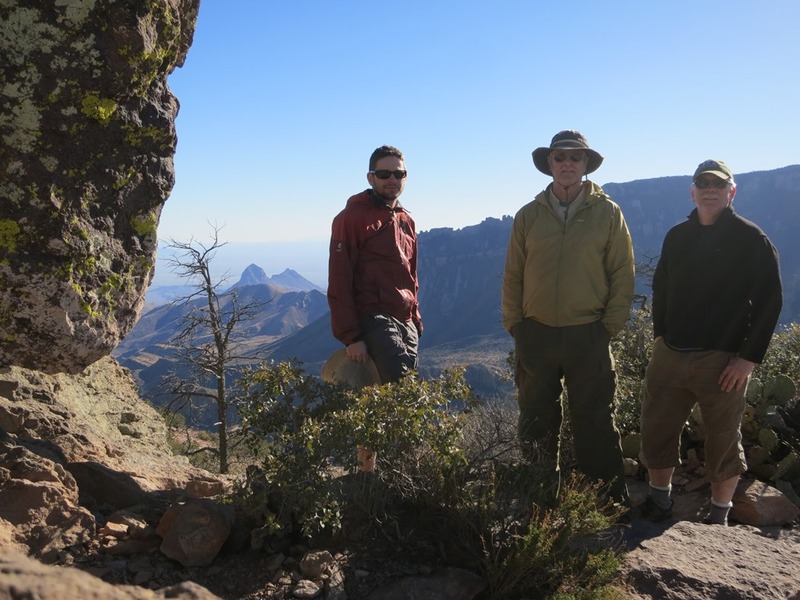 We had great views of both the Rosillos and Chisos in the distance. 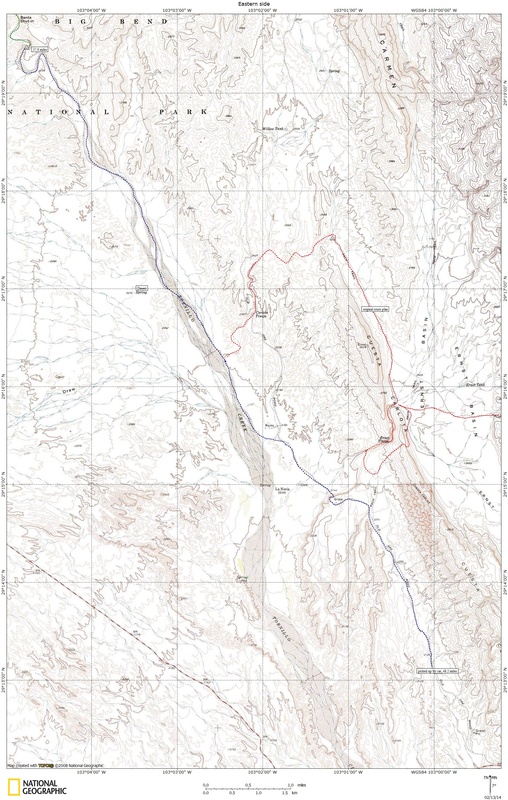 We continued south across flats and washes towards Leopold tinaja. No water and some tough broken country. We worked our way to the bottom and found a spot in the shade for lunch. 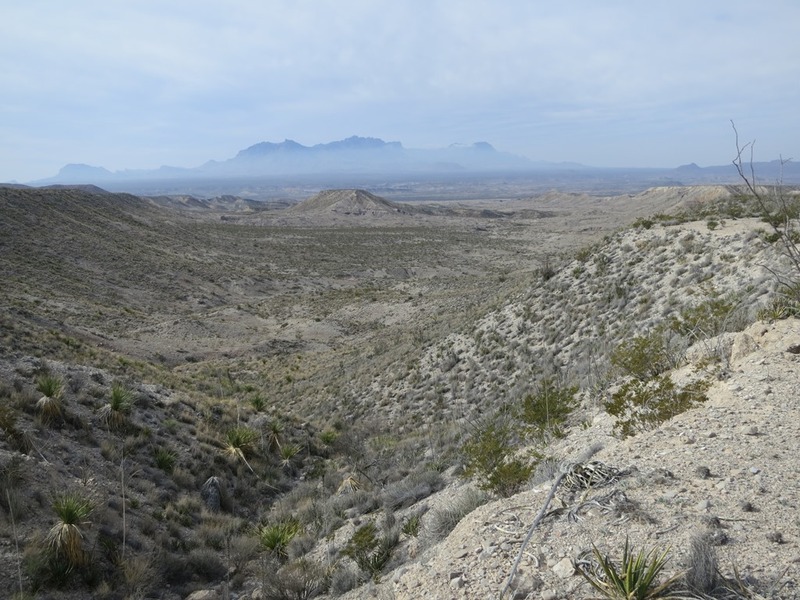 Very thorny route down wash to a larger drainage and we then climbed up the ridge opposite it, just below pt. 3468 and into the top of the drainage that Dickey Well is in. Easy walking and interesting igneous rock layers down to the now toppled wood derrick that was Dickey Well, no water. 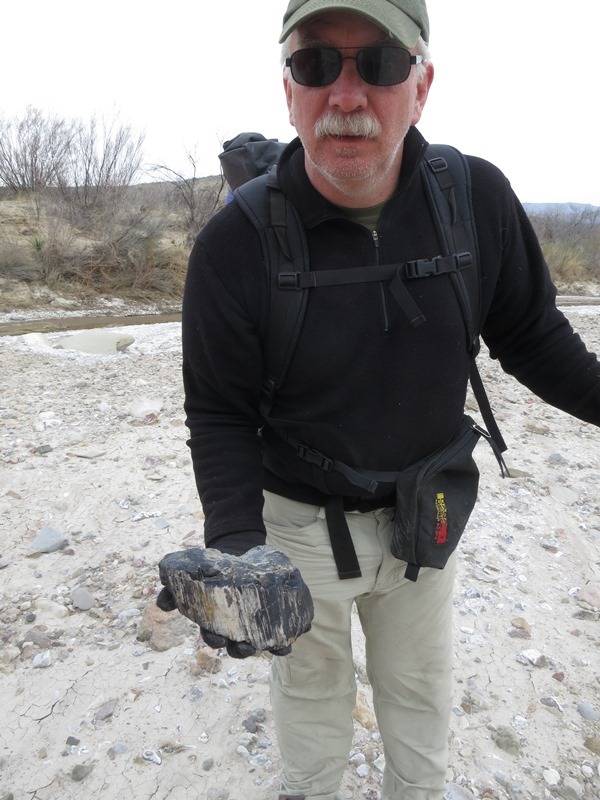 There were several snake trails across the dark gravels in the wash.
Just past Dickey Well we cross the Dagger Flat road and reach our cache. The cache held the next 5 days food and a few quarts of water each, just enough to get us to Muskhog spring. 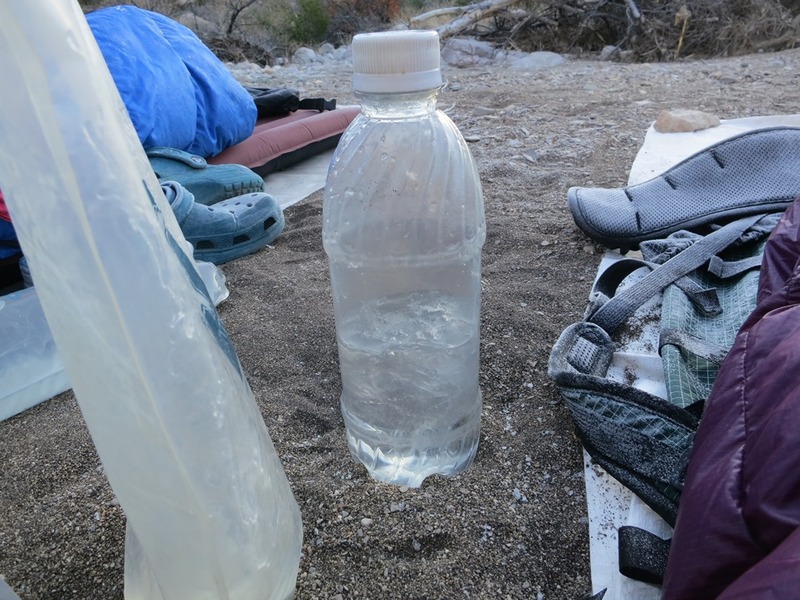 The cache allowed us to carry all the water we needed for the first two days without the added weight of the extra food. 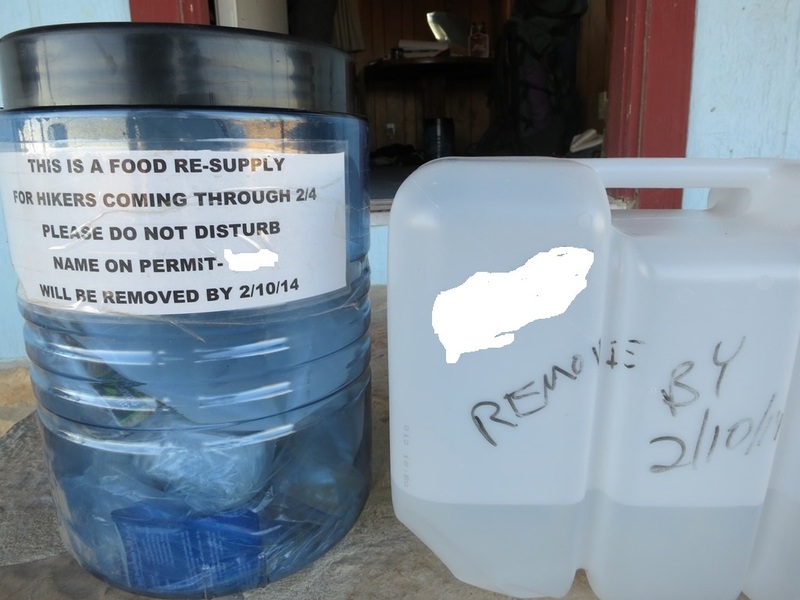 The food was in two Bear canisters, labeled with names and retrieval dates as required by the National Park Service. Names removed to protect the innocent. After repacking we go due south until we hit the Old Ore Rd. (OOR) and run into two motorcycles, the only people we would see in the backcountry the whole trip. This is looking back north at the hills we had just come through past Dickey Well. 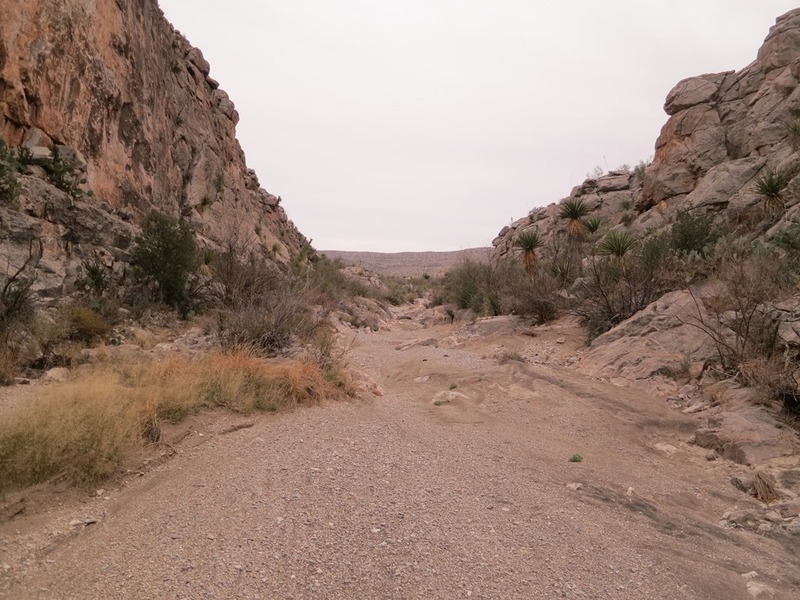 We head down the wash that crosses the OOR at the spot marked 3148. 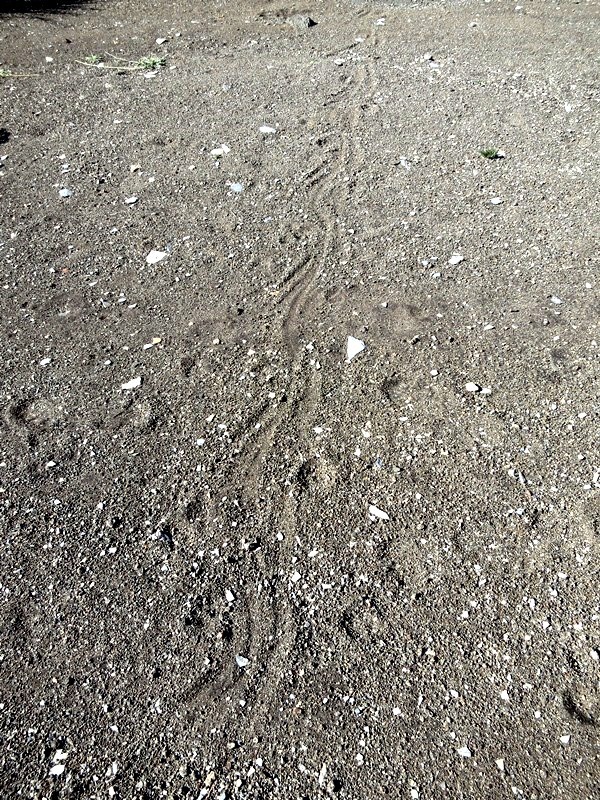 Lots of foot prints and at least one motorcycle track. 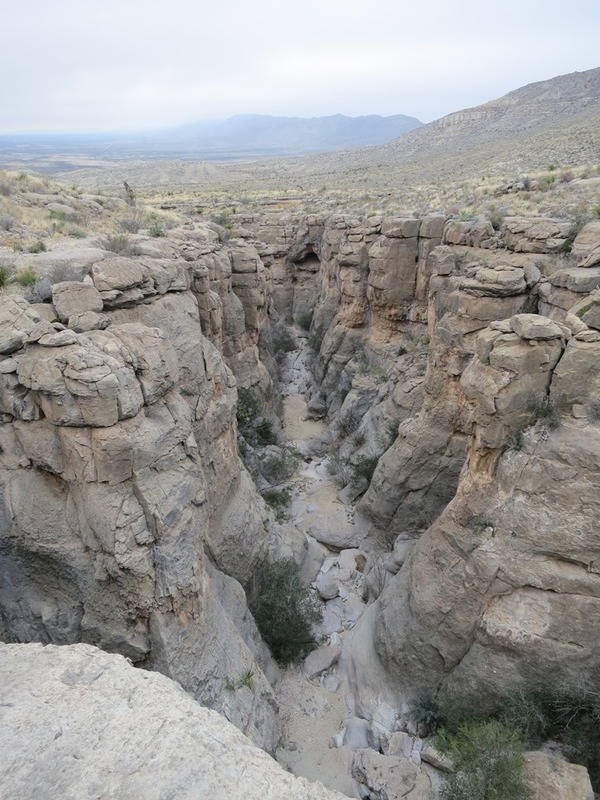 Great formations all along this drainage. 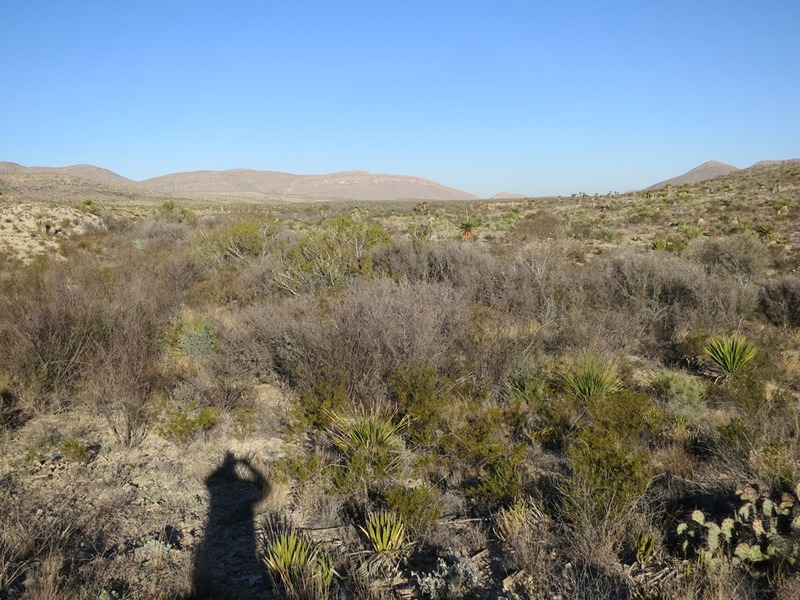 Near the bottom we cut across a low hill over to the Javelina Creek drainage proper and Muskhog spring. 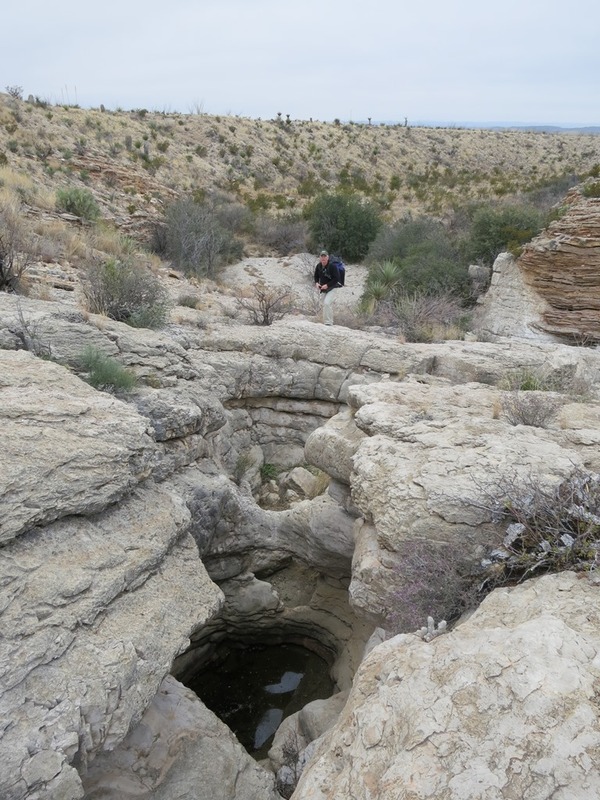 The stone corral is right next to the narrow, layered mouth of the canyon that holds the spring itself. 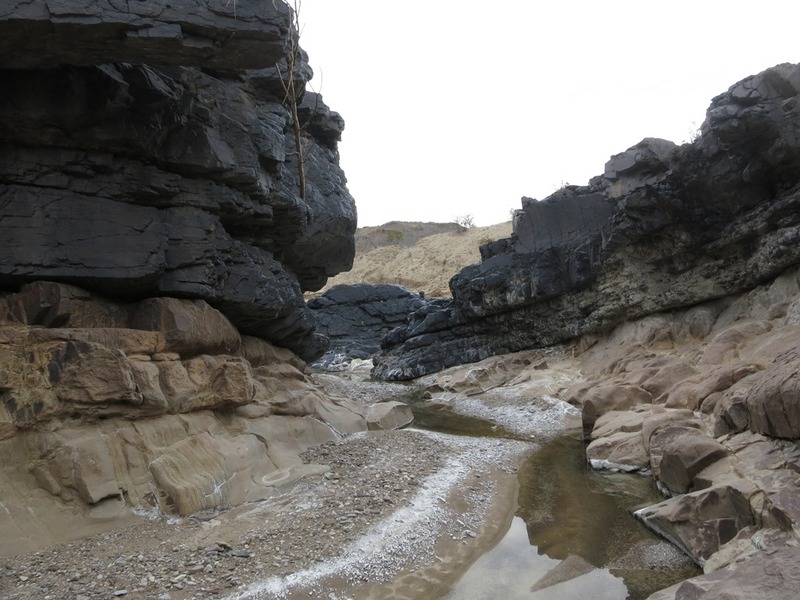 Sure enough there is good water flowing from the pools down the rock and into the gravels at the bottom. A few bees are working the lowest water but they don’t bother us as we get water for the next day. Great water. The wind picks up big overnight, looks like another front blowing in, damn! 36 degrees and we move camp quickly over to a protected area to make breakfast before heading out. 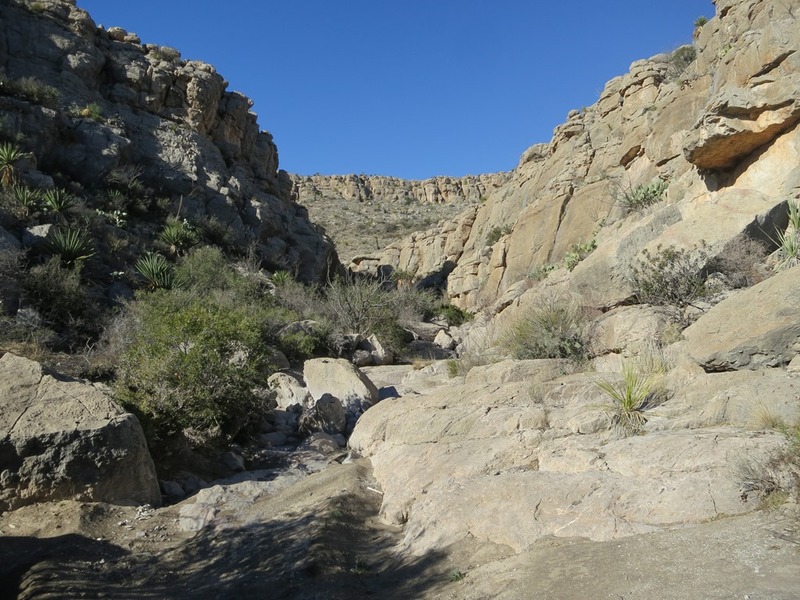 The walk starts out going up the little canyon that Muskhog spring is in and is the Javelina Creek drainage too. 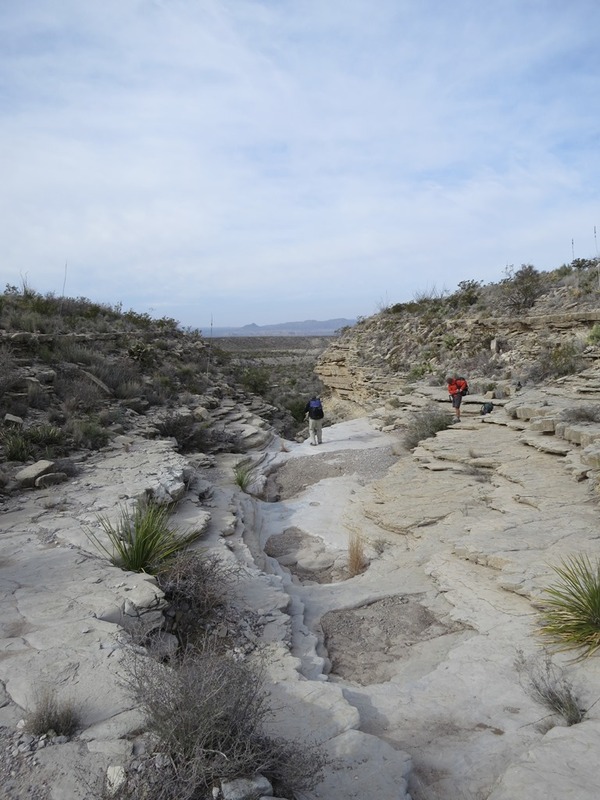 At the top we head SSE across some ridges which are a fault line and the dividing line between the Aguja and Javelina formations where many of the parks fossils have been found. All of the drainages end with pouroffs down to the lower layer. 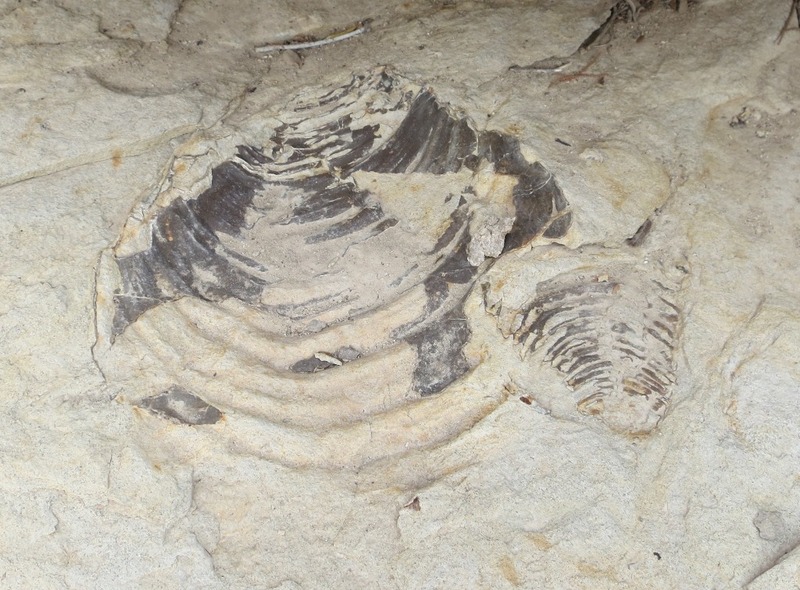 and the ledges above have quite a few fossilized shells. 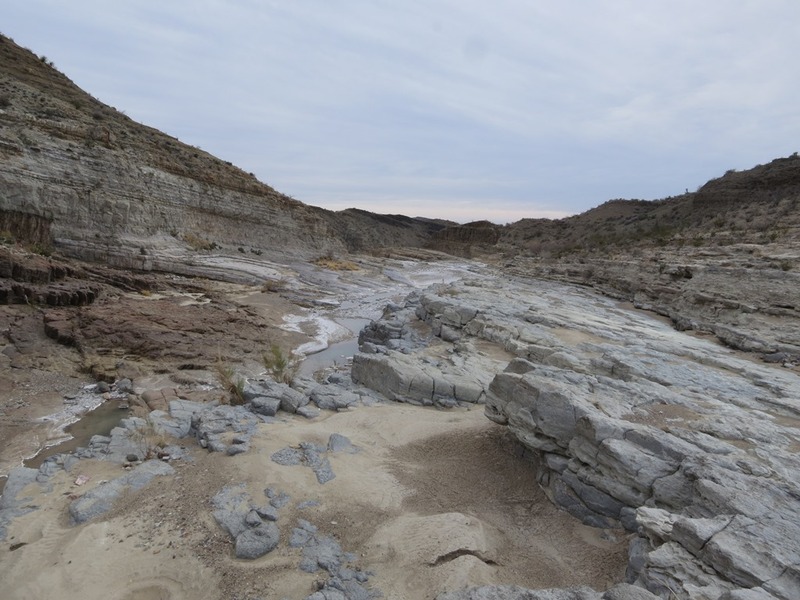 We hit the OOR and walk about a mile and a half down it with the McKinney springs drainage on the east and the huge wash that Mercy spring is in on the west. 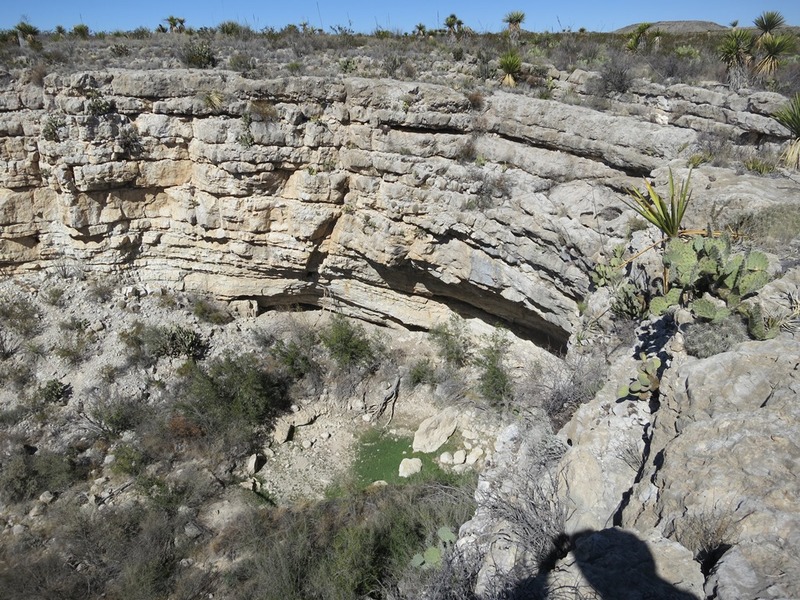 We look for Mercy spring but cannot see it 200 feet below us and are too lazy to climb down to find it. We also are keeping an eye on the ominous clouds rolling over the Sierra del Carmen, hope this isn’t some really bad weather. We do drop off the road down to McKinney Spring with its big cottonwoods and water flowing down wash for some distance. 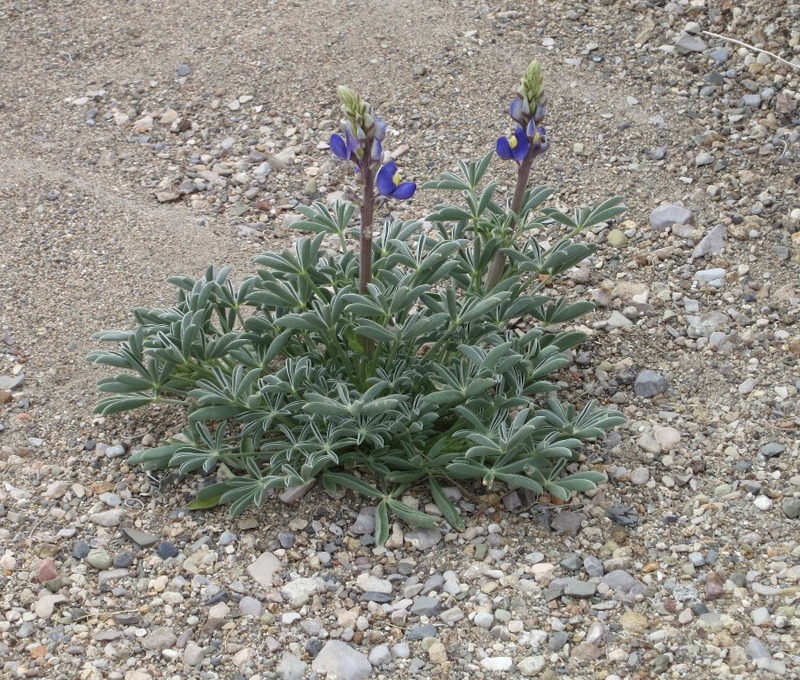 We then follow that wash down through complicated geology to its junction to with Tornillo creek, here we finally see the first bluebonnets beginning to bloom. The wind is still blowing really hard downstream but we find a sheltered spot for lunch before heading down the creek. There is lots of water starting just above the confluence and on down to Banta Shut-In but most of it in pools above the wash coming in from the Roys Peak Vista campsite. 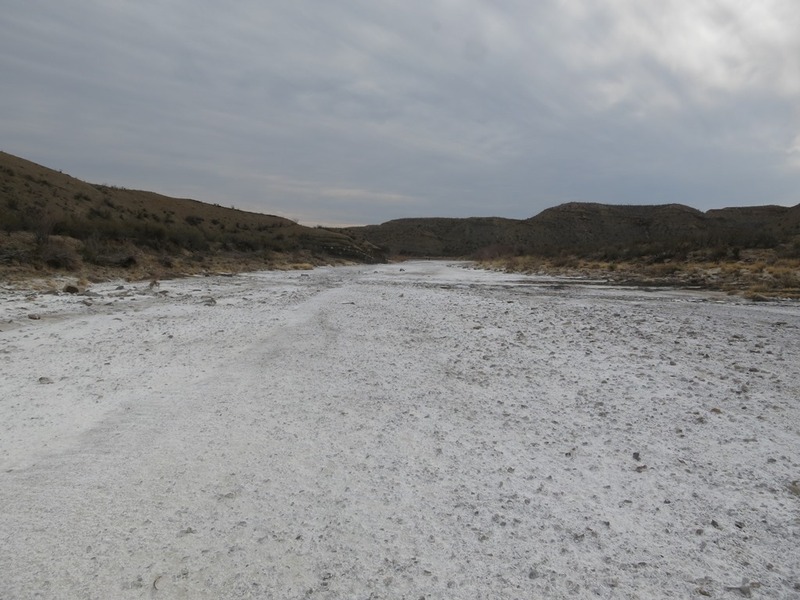 And in places there are so many accumulated salts on the gravels that it looks like snow. 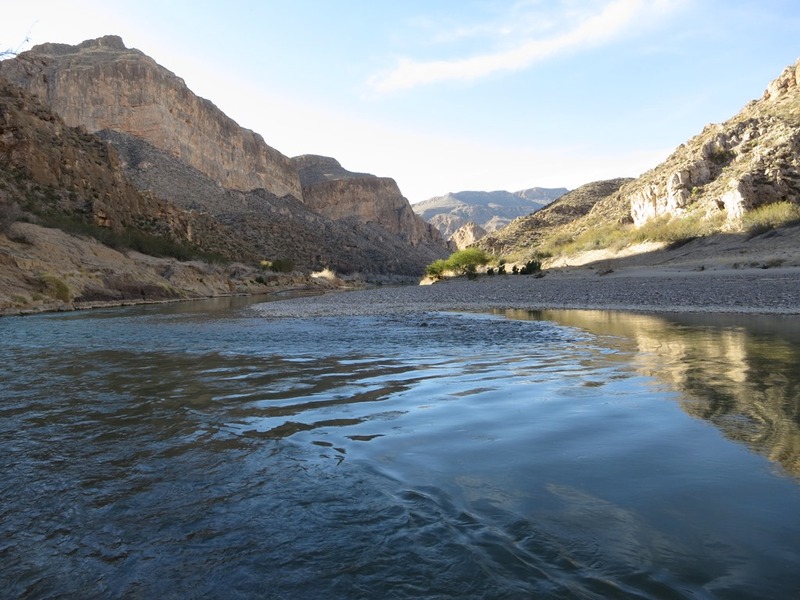 This stretch of Tornillo creek is one of the coolest places I have been in Big Bend. 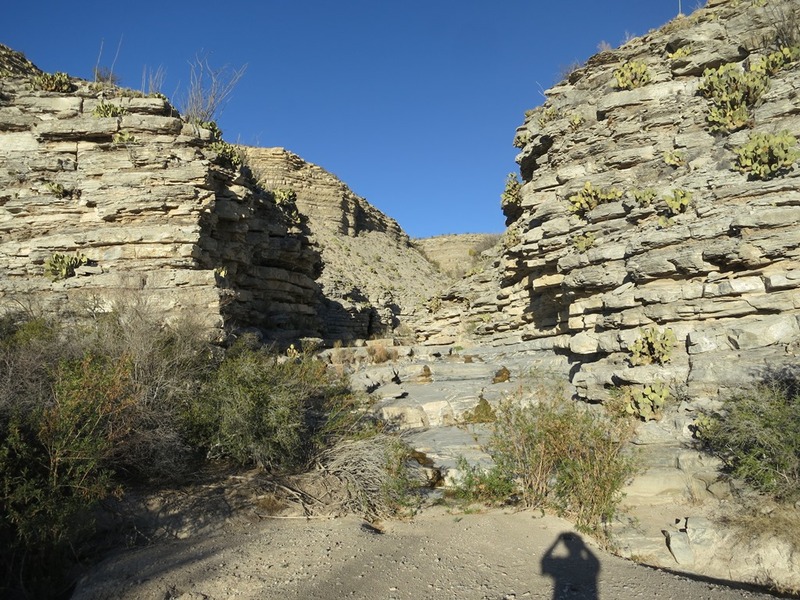 I know lots of folks have walked it but I was blown away by the geology, it also seems to drop a lot of elevation from the ledges you walk down but it turns out to only be about 300 feet. We hit the Shut-In by 4:30 and it is really cold and windy. 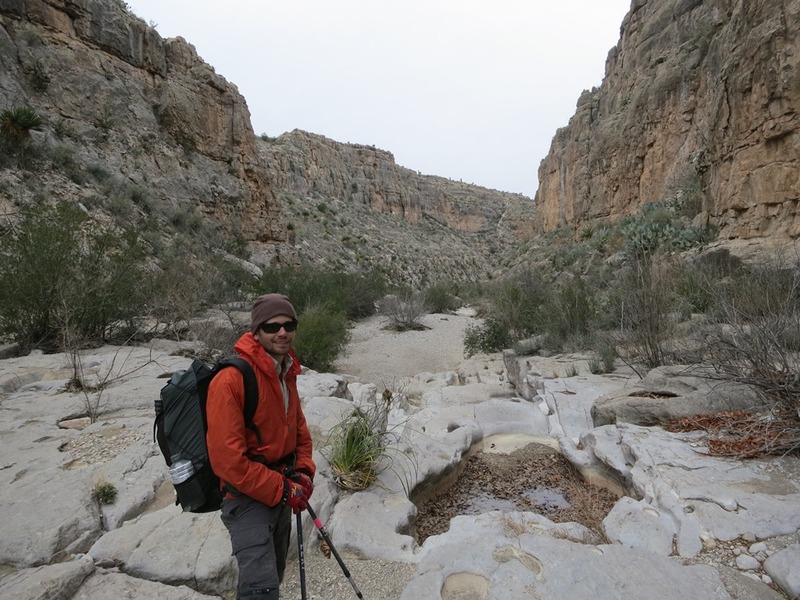 We drop the packs and scout for a campsite out of the wind and to see if we can get through the canyon with dry feet. Last time we were here we had to wade through ankle deep water. 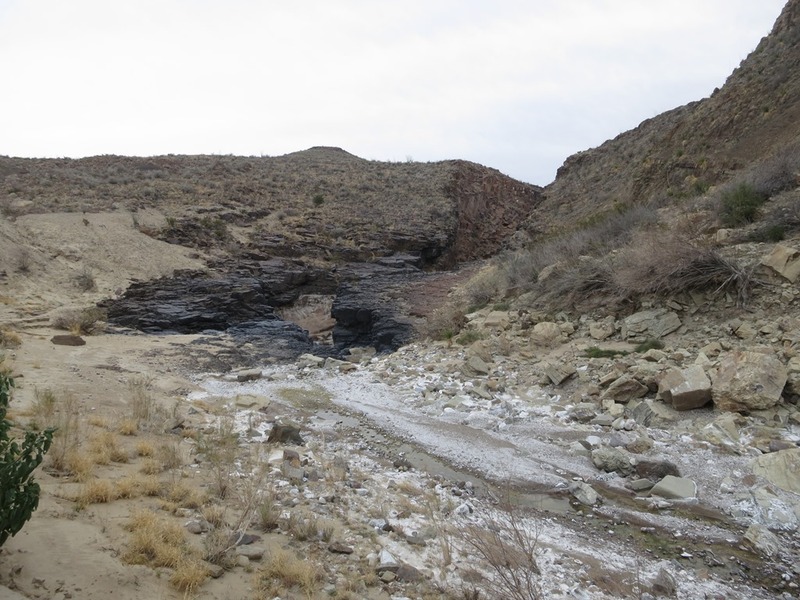 This time it is dry all the way with a few rock bridges that someone had built over some pools near the lower end. No good campsite above the Shut-In so we fill up with about 8 quarts of water each, enough to get us through two days. We get it from a pool just below the spring which is above the Shut-In and has less sodium in it. 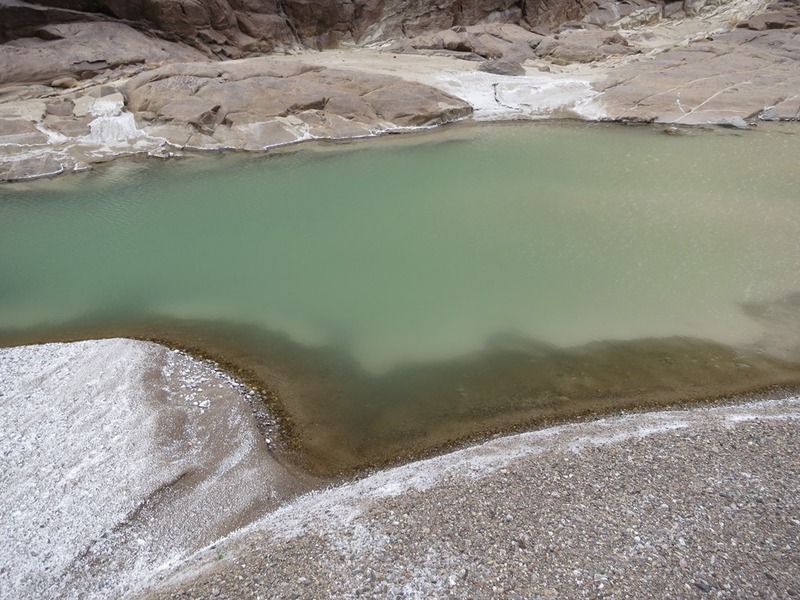 You can see how many salts are dissolved in the water in this pool. These minerals can lead to a laxative effect, let me just say that I have experienced this before and wanted to try and avoid it. We load up the heavy packs and head through the Shut-In, I am always amazed by how black the rock is. 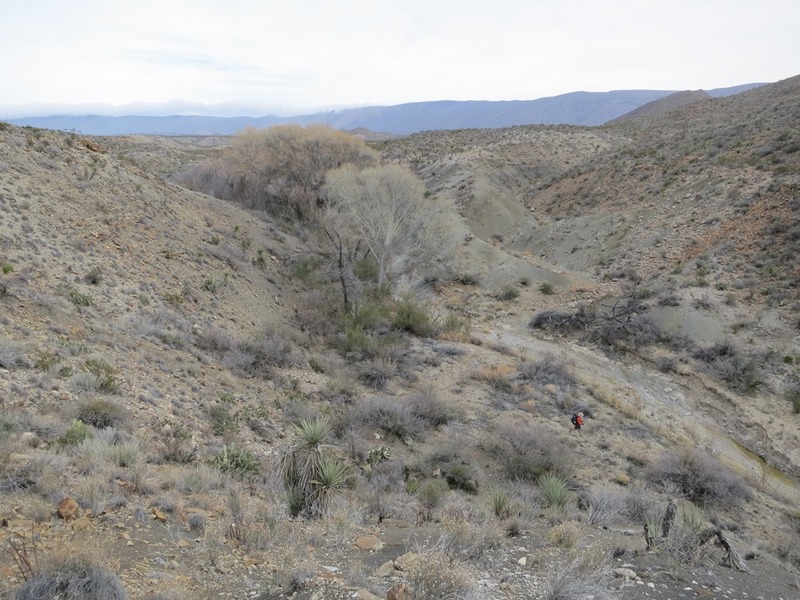 The wind is really blowing hard, both up and down stream depending on the moment and we search for a site on an inside corner that misses most of it. Finally several turns down stream we find a fairly protected place just as it is getting dark. 14.9 miles today and there is a weak sunset, maybe it will clear off again and we can get back to some sun tomorrow. Here is the map for today. The wind continues to blow all night and the clouds become even thicker, 28 degrees the low. This looked like a winter sky for sure. Of the 4 forecasts that I consulted before the trip only one showed any temperatures below freezing and we now had experienced 3 out of 4 nights below 32 degrees with barely the equipment to enjoy that kind of weather. This was getting to be Type II Fun, not fun to do but fun to talk about later (Type I is fun to do and talk about later, Type III is not fun to do or talk about later). I laid out several options for us- 1) go on with the original plan and hope that the weather soon cleared (you can see from the maps that today we were to go up past Carlota tinaja to the top of Ernst Basin, then tomorrow descend Ernst canyon, get water at the tinaja and then on to the Ore Terminal to camp), 2) exit out Estufa canyon to the road, or 3) straight down Tornillo creek to the OOR near Ernst tinaja and hope to catch a ride out to the car. The decision was made to go out for a day and let the weather settle, warm up and then go back in to do the Marufo Vega trail the last two days, as was the original trip plan. 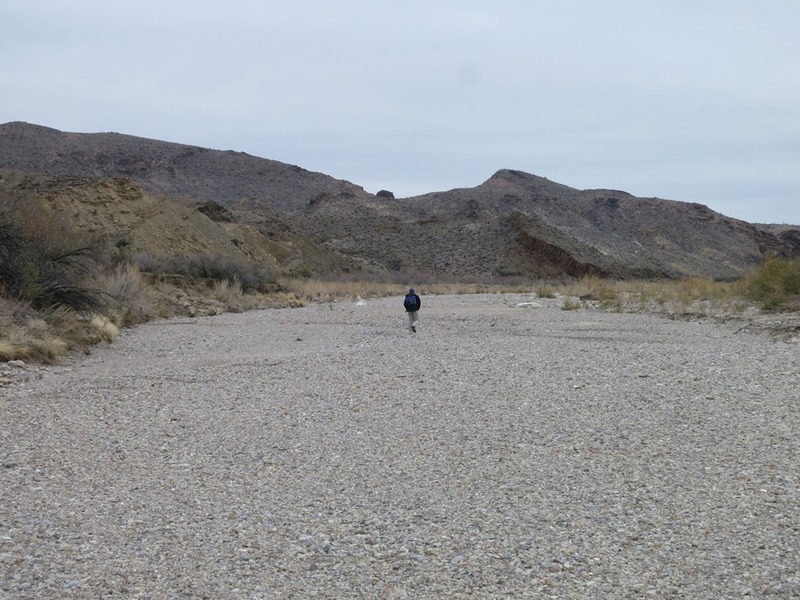 We threw on the afterburners and rolled down the big gravel bottomed wash of Tornillo creek at a 3 plus mph pace and hit the OOR after 8 miles about noon. 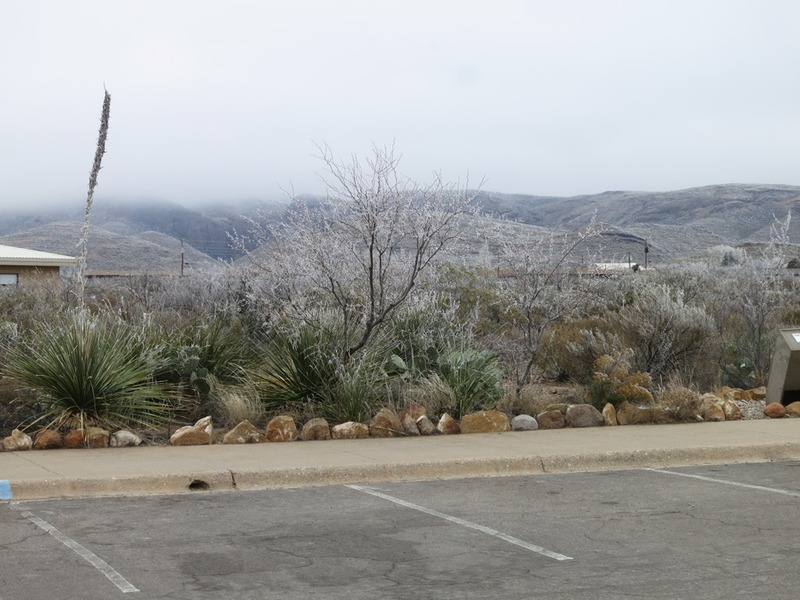 We could see several vehicles at the Ernst tinaja parking area so we began walking the road towards RGV figuring they would come along sooner or later. 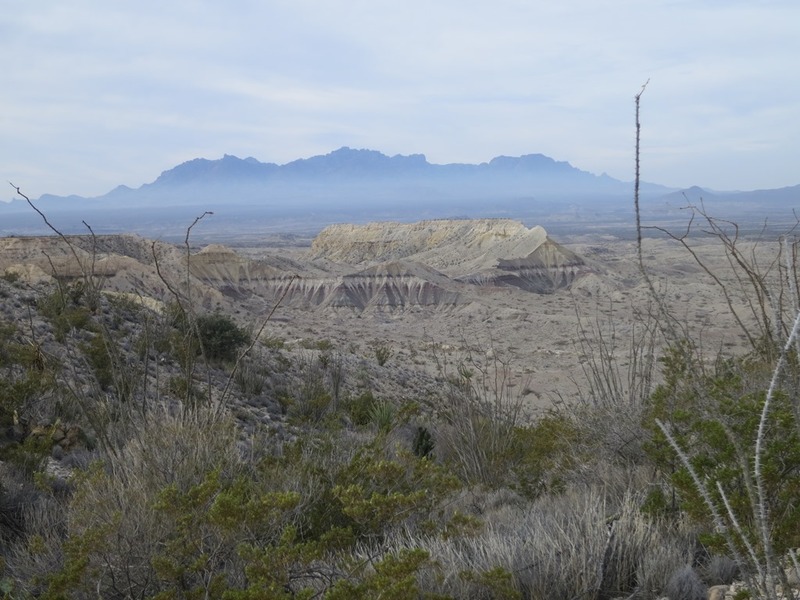 The Chisos were totally in the clouds, with the level down around 4000’, temperatures down here still in the 30’s. Sure enough along come two SUV’s with folks from the Louisiana Hiking Club who are in the park for a week or so. 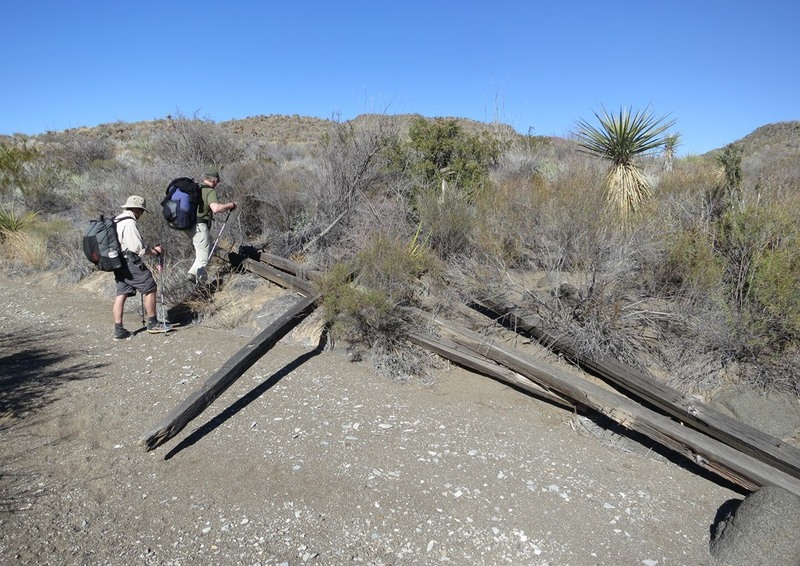 They take Scott out and down to get our car at the Boquillas crossing, thank you good folks! Lee and I continue on down the road and in an hour Scott rolls in to get us, heat blasting. 10.3 miles today. We stop at PJ to check the weather and everything above 4000’ is covered in rime ice from being in the clouds and the high for the day at PJ is 29 degrees. Tomorrow is to be sunny and 60’s, then the 70’s after that for a few days. 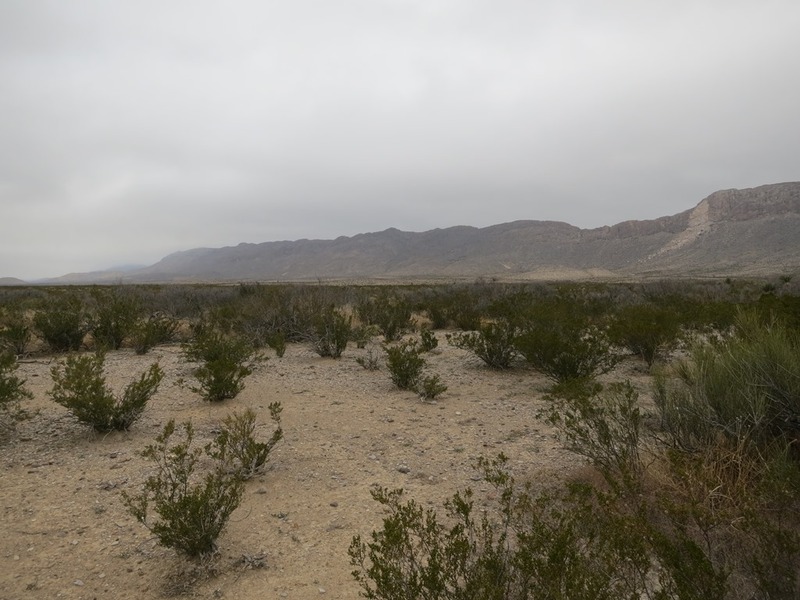 As we round the west side of the Chisos the clouds and the front are beginning to clear, typical. 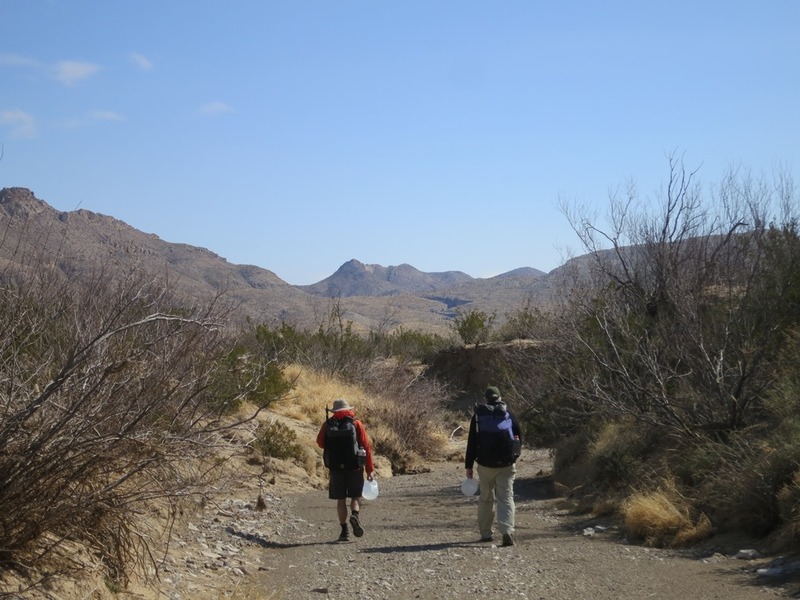 Off to the Chisos Mining Co. Motel, showers, beers and to the Starlight for dinner. Here is the map for today. 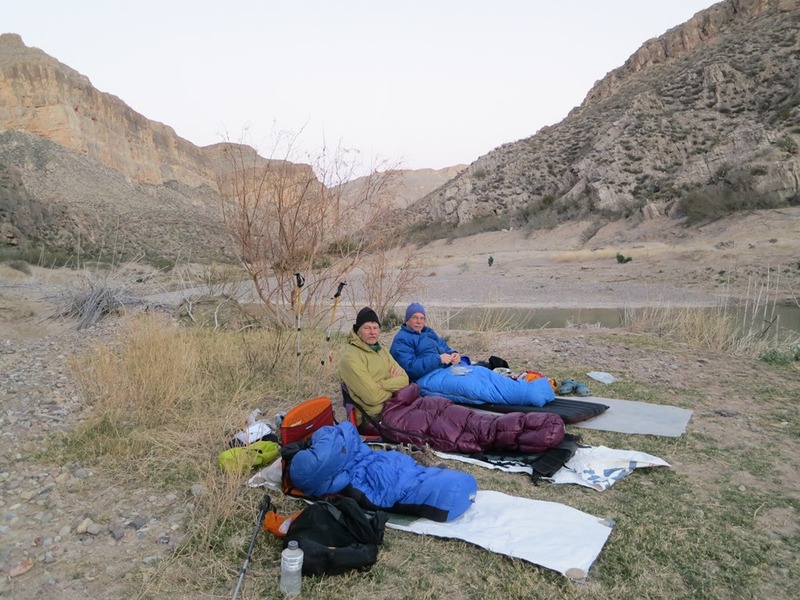 Still chilly in the morning but a good breakfast at the Chili Pepper Café and off to do Upper Burro Mesa Pouroff trail. Nice walk with a few drops to pay attention to, especially that last one. 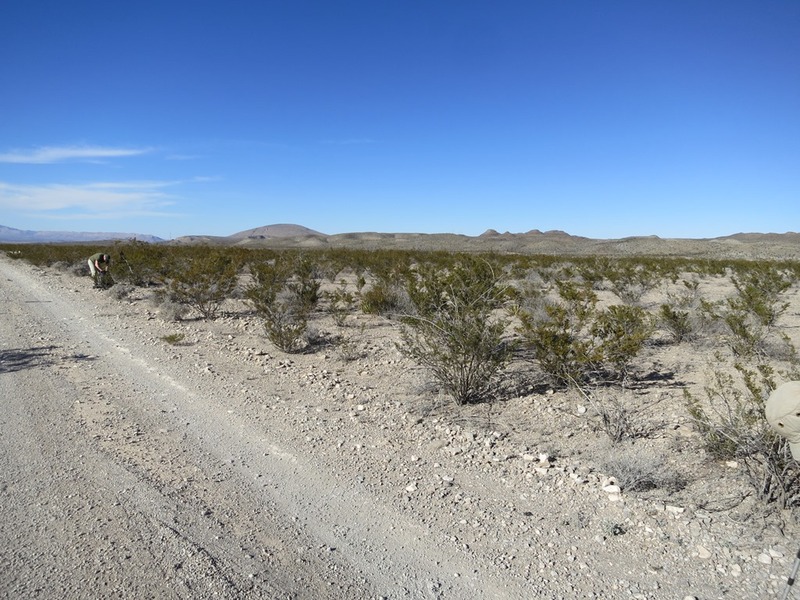 We then go to retrieve our cache so that chore is done and opens our options as to which route to take back to Austin. We spend a bit of time at PJ watching the new park film (worthwhile) and perusing the books etc. We head up into the Basin for lunch and then we walk up the Lost Mine Trail. Lots of folks coming down complaining about the wind but when we get up top it has slowed down and we have it all to ourselves. Back to the room to do some packing, then off to the High Sierra for dinner and some live music. There is quite a pall cast over the community in the wake of the death (murder?) of Glen Felts (owner of La Kiva Bar and Grill) and it is the talk of the night. Despite way too many beers and a very late night we are up and at the Chili Pepper when they opened at 8:00 and at the Marufo Vega trailhead by 10:00, clear skies and pleasantly warm. We reconnect with our original route plan as we would have come down the Ore Terminal trail this morning and then onto the MV. Fairly quick climb up to the first little pass, after the amazing quartz crystal paved pathway and we somehow are distracted and miss the turn up to the steep climb and end up down at the Strawhouse trail. Back up the trail and then the steep climb. 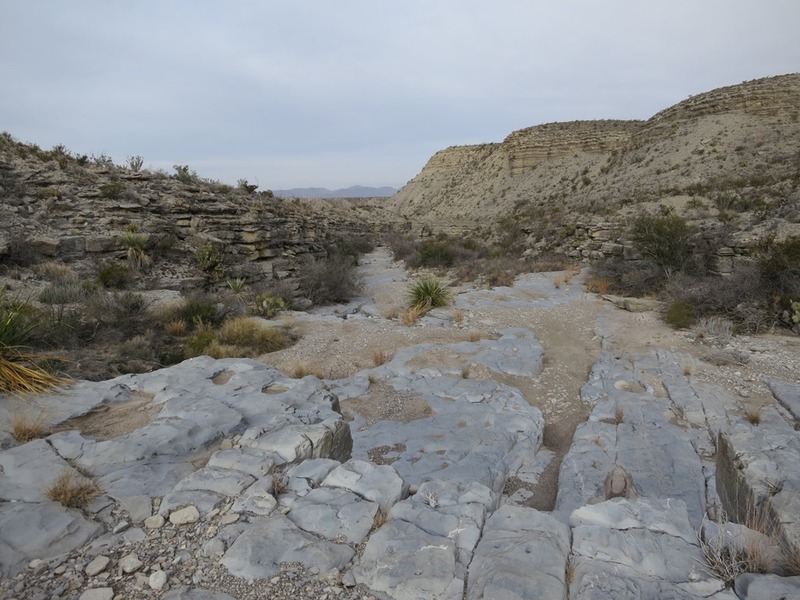 The goal for lunch was an off trail, dramatic overlook down into Boquillas canyon, easy enough to identify the correct wash but a slow and thorny approach. Lunch was had lounging on the big limestone slabs enjoying the view. It was getting a bit too warm though and surprisingly no breeze so we headed back to the trail and pushed on to the river. 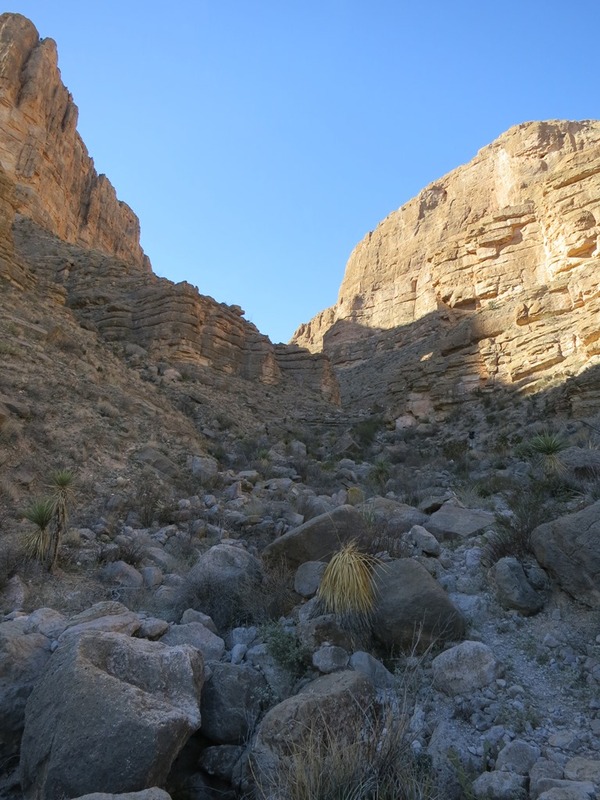 I was not expecting the “rocky drainage” as described in Hiking Big Bend to be so much of a canyon but it did at least funnel some slight breeze down it and offered a few spots of shade as it was getting warmer. The high for the day at RGV was 80 but the thermometer on my pack registered 97 at one point. One can see how people can get in trouble with heat stress out on this trail. 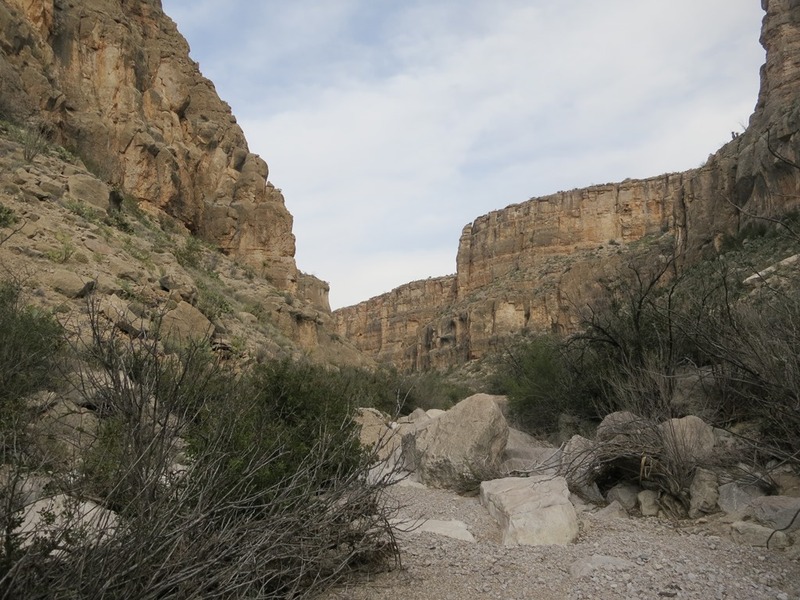 We push on along taking in the increasingly massive views down into the canyon and of the Sierra del Carmen in Mexico. We take one last break in the shade of the Split rock campsite and then start the rocky descent to the river along the south fork. 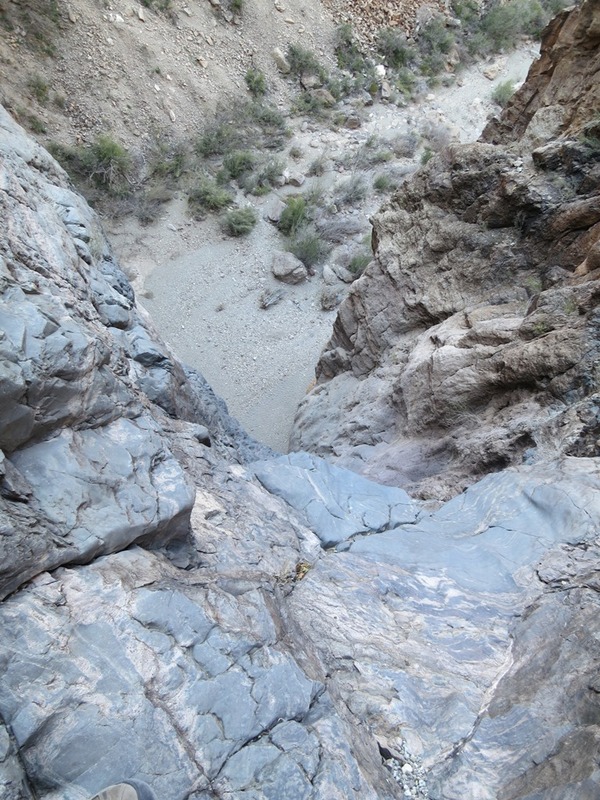 The final drop on the south fork is pretty steep (800′) with a few switchbacks and lots of baby head rocks that can send one sliding but it is short. There is also no shade in the afternoon. The additional side trail down to the river is also very steep but quickly drops you out onto the huge river rock/gravel bar beach. There are deep silt deposits left after the 2008 floods that I am sure also took away what had been more beach than exists now. 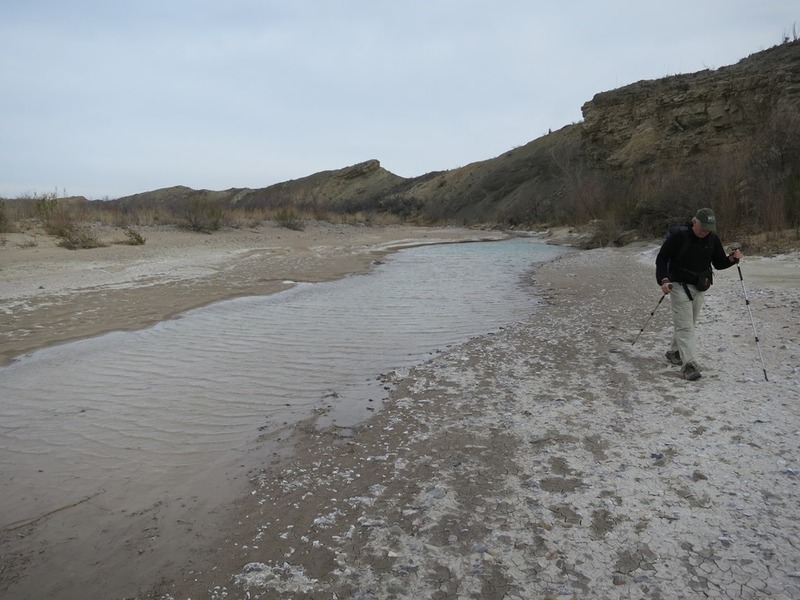 We find a patch of grass covered silt on a slightly elevated part of the gravel bar on the downstream end and close to an access to the water. Still not much breeze but the late afternoon shade is pleasant other than the pesky gnats. 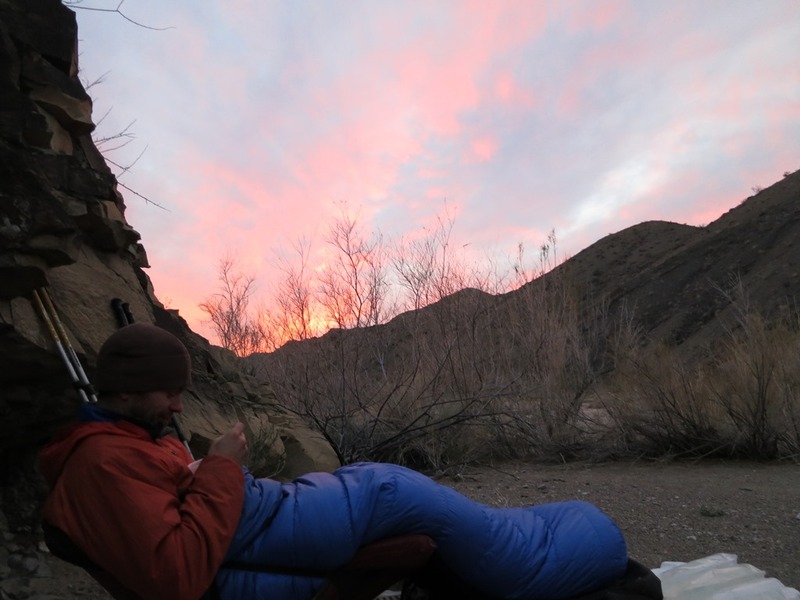 10.4 miles today and a very enjoyable evening followed including the evening glow on the canyon walls. Finally a more normal night with the low only 41 degrees. 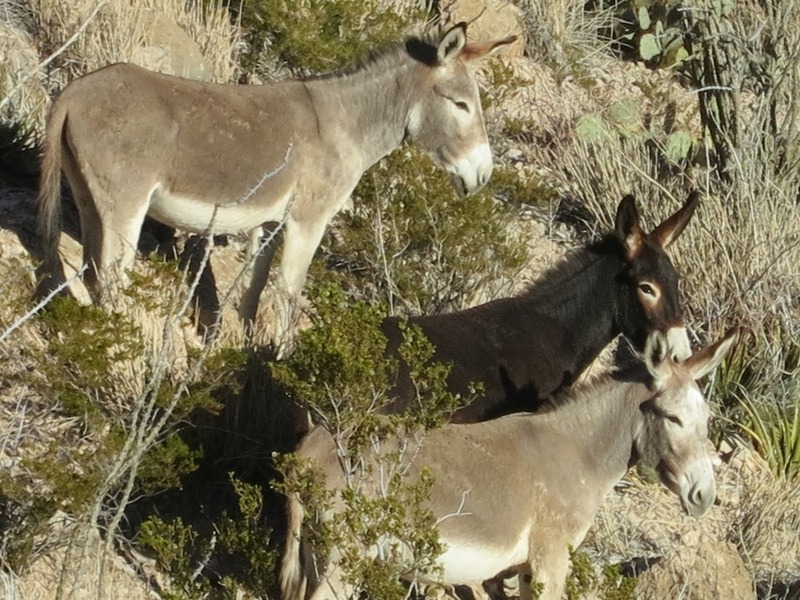 We have breakfast to the sound of the river sliding by and finally the braying of the resident burros that so far we had only seen signs of their deposits. Earliest start yet as we want to get the climb back out of the canyon done before it gets too hot. 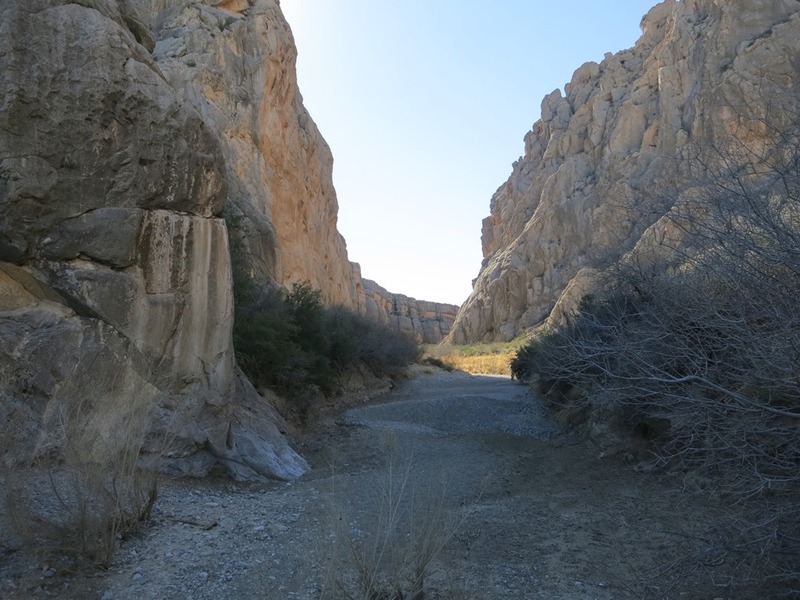 It is a nice contour walk along the slopes above the river and is very reminiscent of the Grand Canyon. 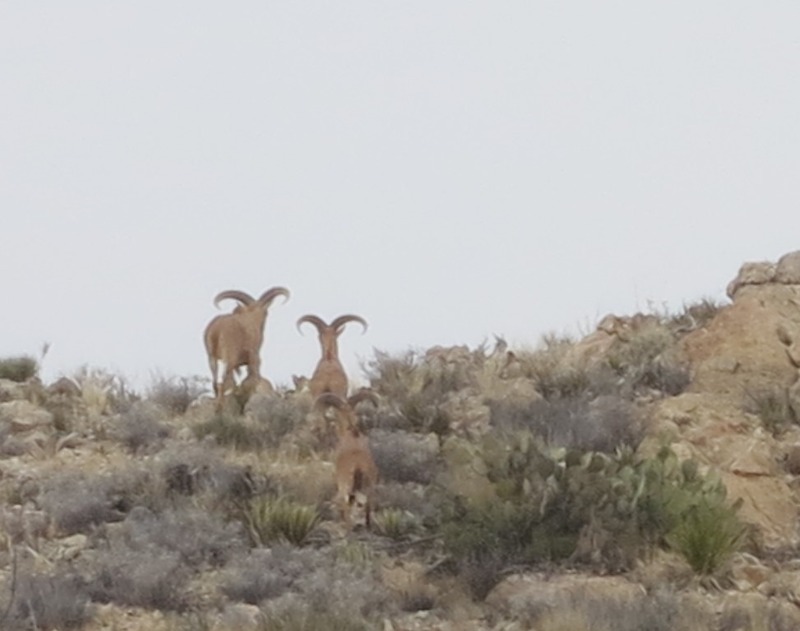 We finally meet the canyon’s most prominent residents who give us the right of way but you always have to watch out for the black sheep in any group. We get to the base of the north fork trail and the 1000’ climb by 10:00 then start up in the shade with a breeze, couldn’t be any better. The north fork has much better trail construction and footing and I would highly recommend it for the climb out. 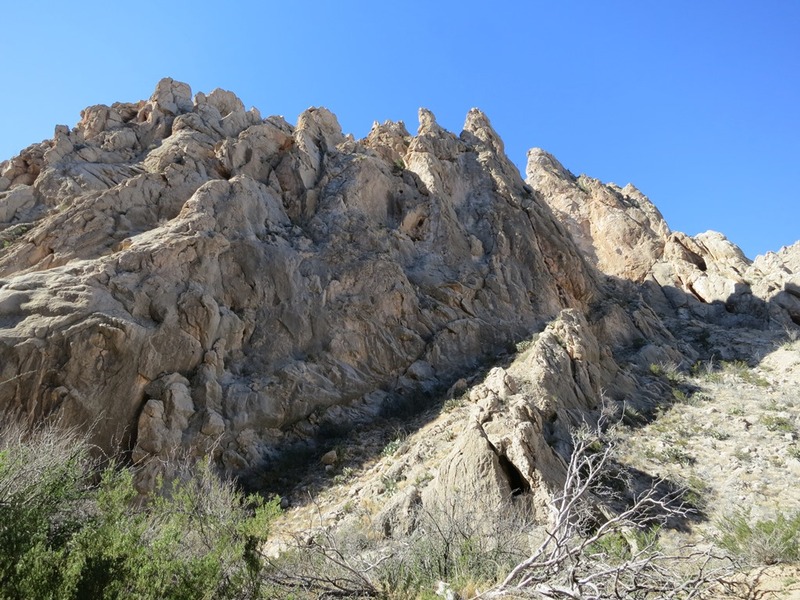 There are a few spots where it climbs around some short rock faces but it is much better than the south fork. We are quickly to the top and down to the junction of both forks by 11:00. 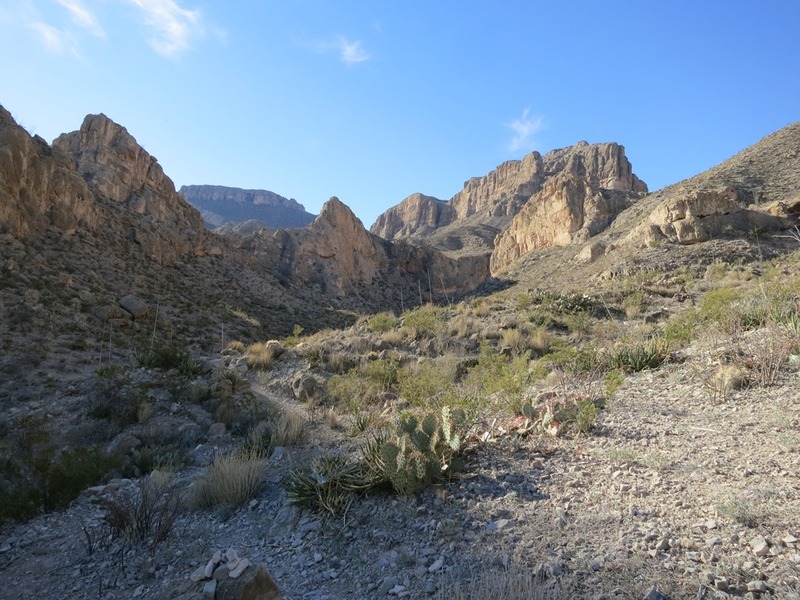 I originally had wanted to take a cross country route over a low saddle near the junction of the two forks and then down into Ernst Valley north of the middle canyon on the Strawhouse trail but as it was getting hot so we headed for the easy route out. 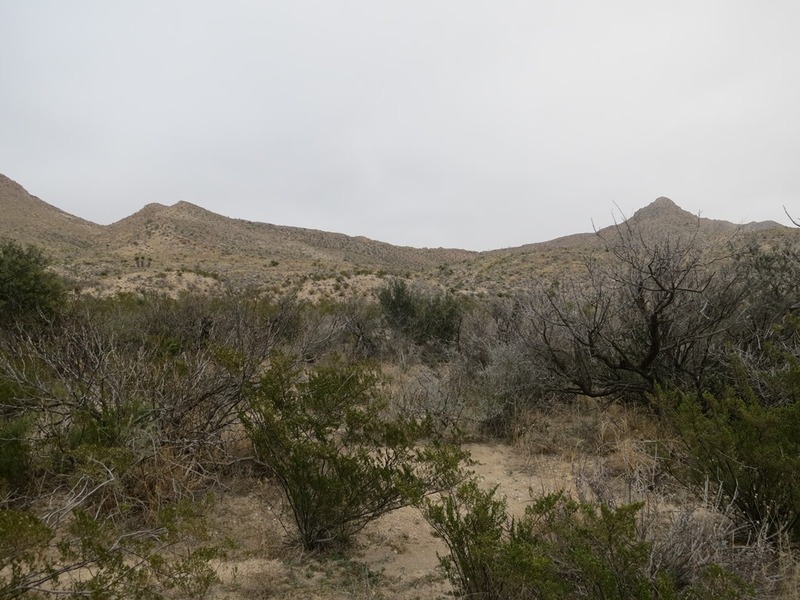 We did take the northern side trail down to the Strawhouse past a big pouroff where we saw a dead Aoudad on a cliff ledge. Great view of lower Ernst Valley and the last canyon on the Strawhouse trail. 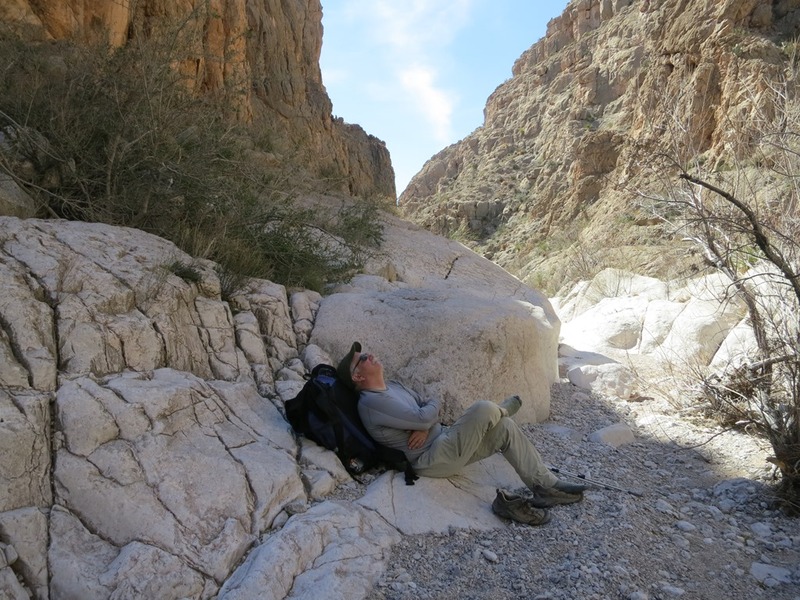 We take one last rest in the shade in the great little canyon and then push to the car. A bit slow going because there have been so many people walking this wash the gravel is no longer firm to the foot. When we came through here in Dec. 2004 I don’t think we saw a single set of footprints. Back to the car by 1:00, trip done! 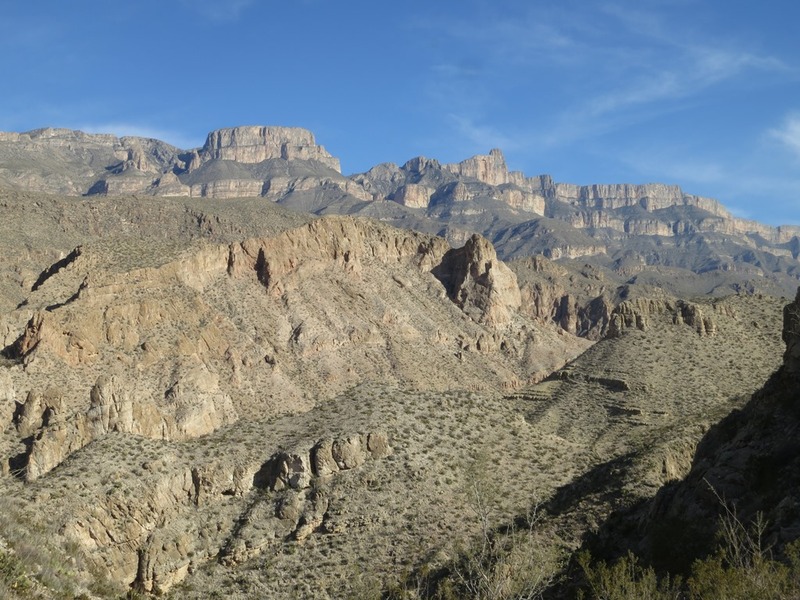 Down to RGV for ice cream sandwiches and other assorted junk food and then we head for the Chisos Mining Co. Motel. 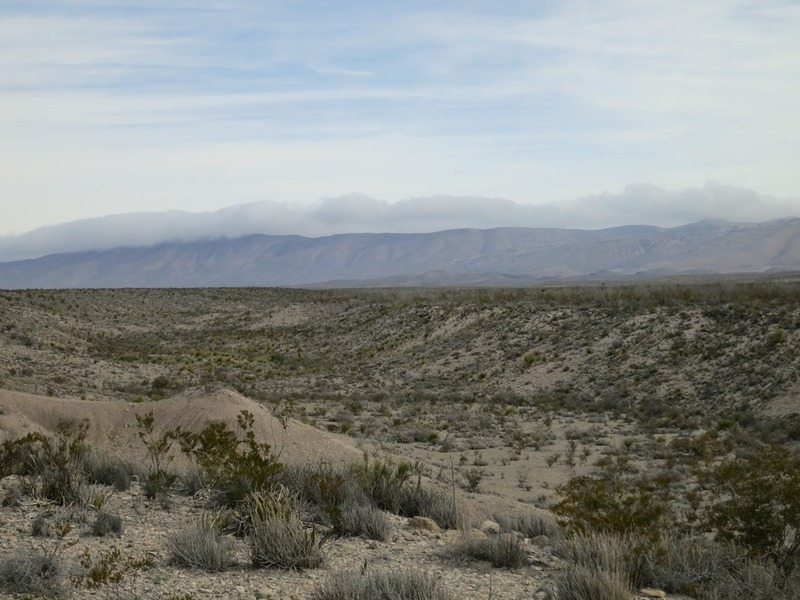 Showers and then to Terlingua to soak up the view and the atmosphere. Pretty good crowd enjoying the sunset and the warm temperatures. Dinner at the Starlight. The next morning we head back to Austin via Alpine with plans to take US 90 to Del Rio then 377 up to Junction to take in some sights. 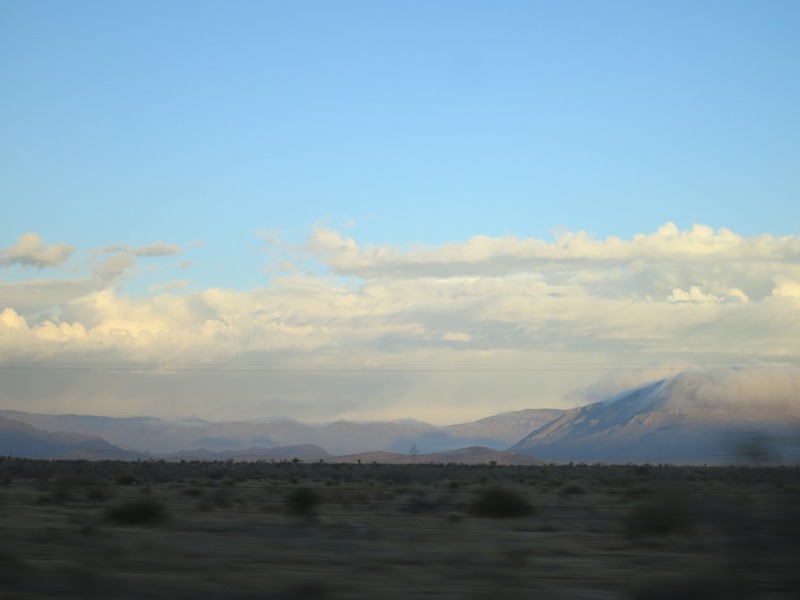 As we climbed the pass south of Alpine we hit a tremendous cloud bank from the next big cold front crossing the country. The temperature dropped from 48 to 32 degrees in a few minutes and visibility was very limited. We knew this front was going to hit home the next evening so we changed plans and headed towards I-10 for the faster route to Austin. Stopped at Cooper BBQ in Junction which would be our only opportunity for reasonable Q as we had changed our flights out from tomorrow afternoon to the morning to get home before the big storm hit. Our original plan had been to enjoy some great BBQ around Austin for lunch, get some to take home and then fly out after lunch, not going to happen. Good thing we changed plans because this storm crippled the east coast and airports. 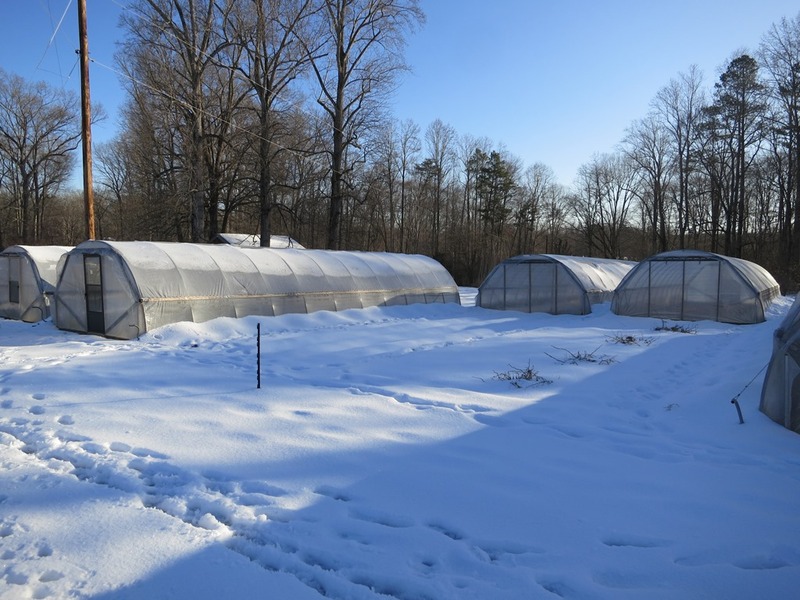 Got home Tuesday evening and then spent the next day and night sweeping snow and sleet off of greenhouses to keep them from collapsing from the weight. Success and no power outages! Another great trip to the park, didn’t go exactly as planned but we still saw lots of amazing things. 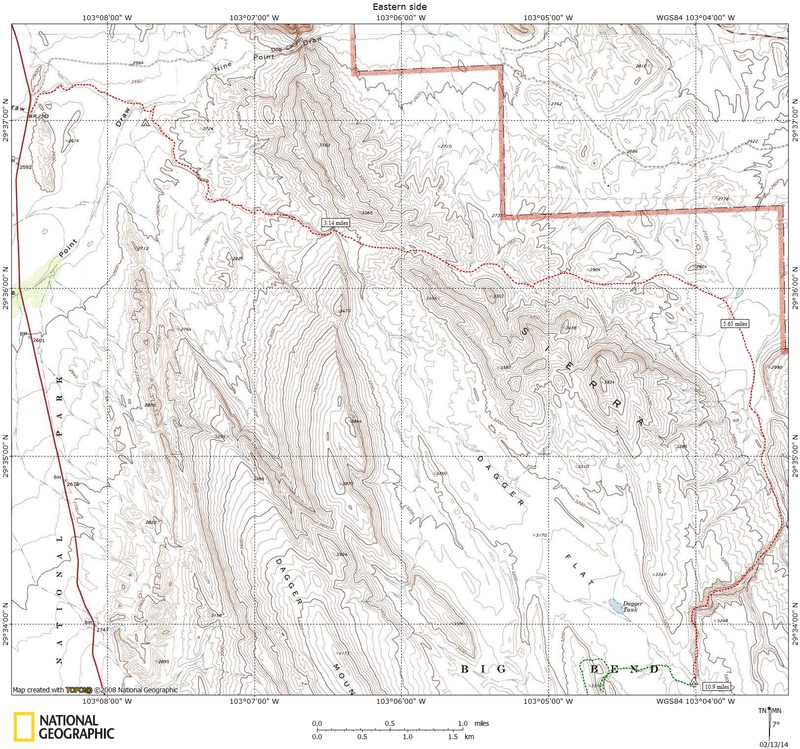 I am still lacking Ernst canyon, tinaja and Basin but now the gears are turning about an Ore Terminal/Ernst Basin/Telephone Canyon/Arroyo Venado/MV loop hmm? 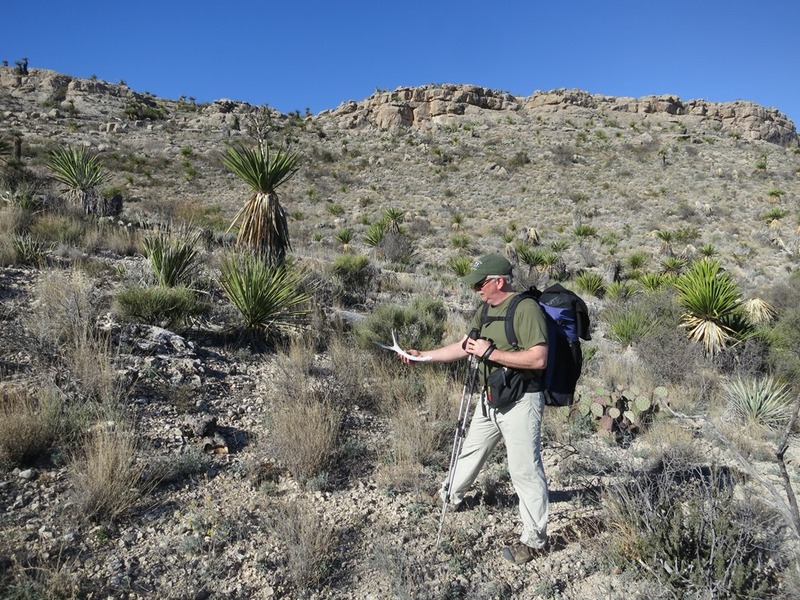 This entry was posted in Big Bend and tagged banta shut-in, big bend, dagger flat, devils den, dog canyon, eastern side, lost mine trail, marufo vega, mckinney spring, muskhog spring, tornillo creek, upper burro mesa pouroff. Bookmark the permalink. Awesome account, great pictures. Thank you for sharing your adventure. I love this place also. New Year’s 2014 was my first trip to BBNP. Amazing place. Got home after a week there and immediately started planning the next trip. You’ve provided a great resource, not only for BBNP, but for all of the other places you’ve walked. Thanks Bro! It is an addicting place, I am always thinking about my next trip!